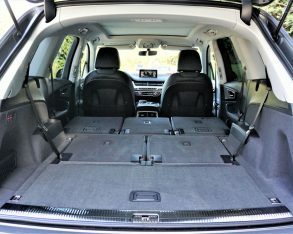 Where is the world’s best mid-size luxury SUV made? 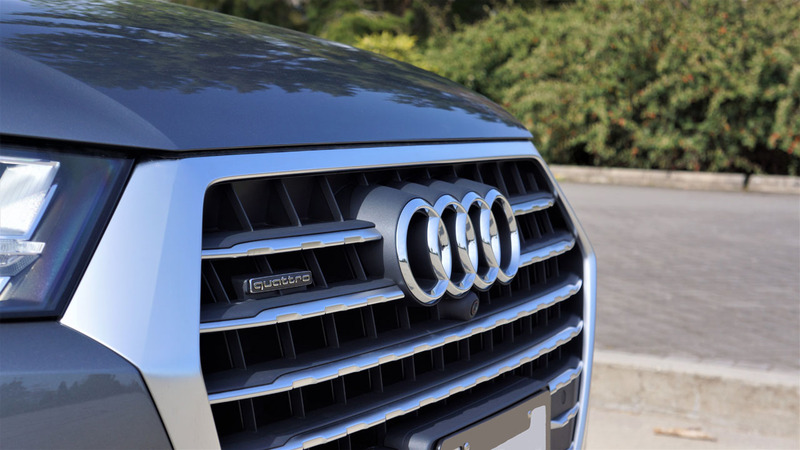 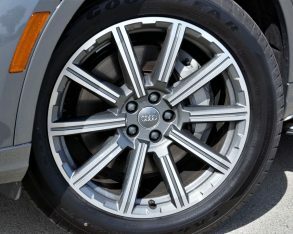 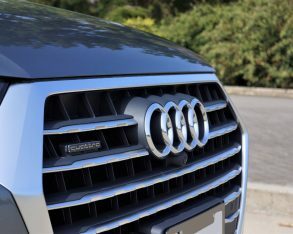 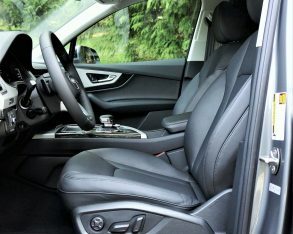 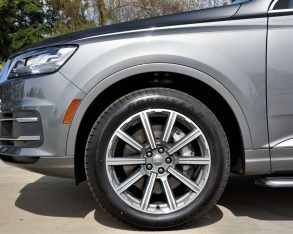 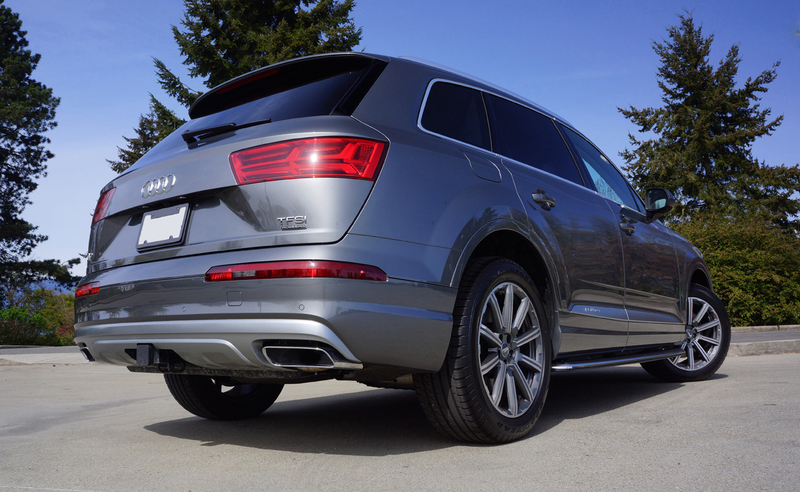 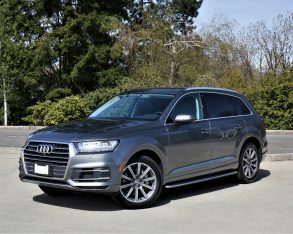 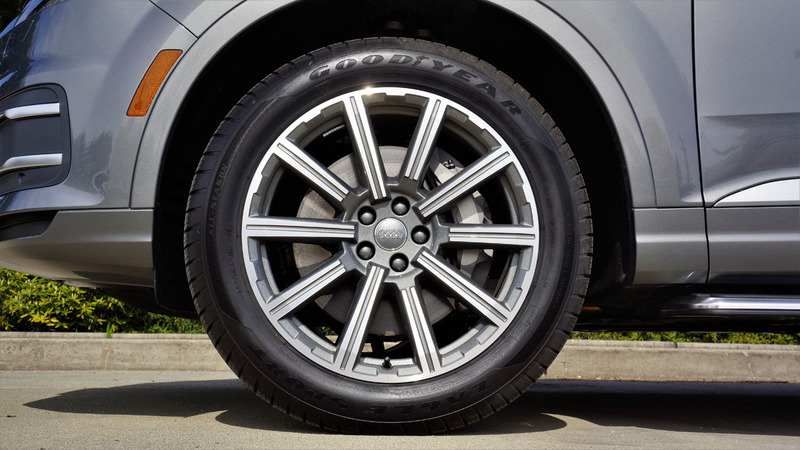 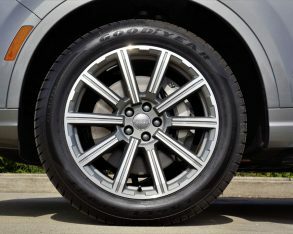 Audi can make a good argument for Bratislava, Slovakia, where its recently redesigned Q7 SUV flagship has been assembled since inception in November of 2005, when the 2006 first-generation model arrived on the scene and almost immediately became the darling of the seven-passenger luxury crossover SUV market. 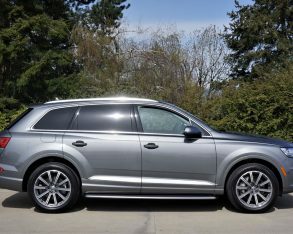 Astute readers will correct me by stating the Q7 is also produced in Kaluga, Russia and Aurangabad, India, but the one we get hails from the quaint Slovakian capital that flanks the Danube River, its fertile banks surrounded in vineyards, the entire area nestled within the Little Carpathian mountains, a picturesque part of Europe that rivals its Austrian and Hungarian neighbours for good beer and good times. 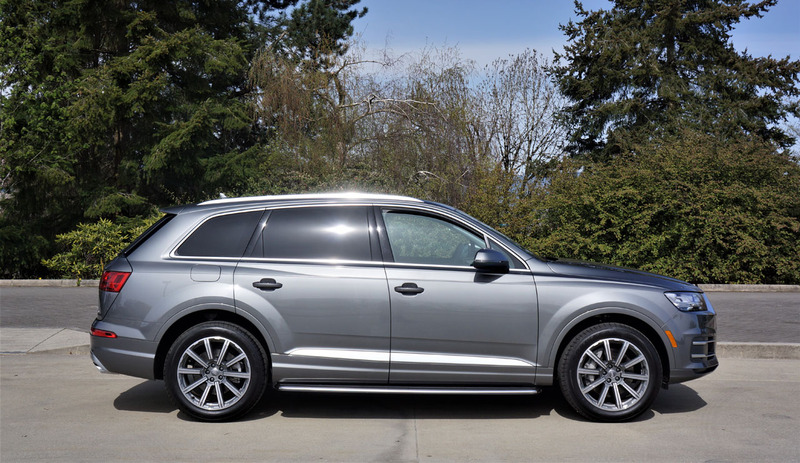 This said the only Audi vehicles I’ve ever driven through Europe were on Austrian and German roads, and never once in a Q7. 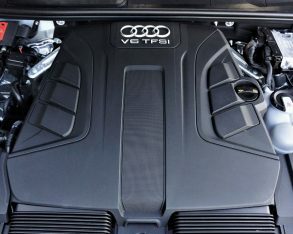 My four-ringed adventure began in the Alps near Salzburg aboard a bevy of TT Coupes, followed up by the premium brand’s A8L flagship sedan powered by a ridiculously potent turbo-diesel V8 on the autobahn between the Red Bull capital (and of course childhood home to Mozart—I walked past Hagenauerhaus on my way to dinner while visiting on a separate occasion with Maserati) and Audi HQ in Ingolstadt in Ingolstadt. 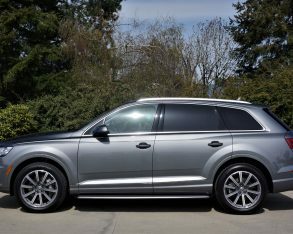 How I would love to drive this new Q7 over the same routes, or for that matter any of the other circuitous European roadways I’ve grown to appreciate from many visits across the Atlantic since youth (back then we had a VW 411 “Squareback”, not exactly in the same league). 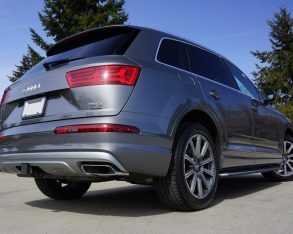 The first-generation Q7 aged gracefully, having managed to maintain its popularity despite few updates during its decade-long run, which is a nod to the original SUV’s good inherent design both aesthetically and mechanically. 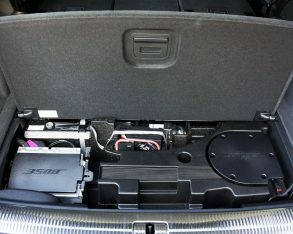 This second-generation version, which arrived in 2016 for the 2017 model year, rides on a new lighter weight chassis architecture that’s allowed for a significant 300-kilo (660-lb) reduction in mass, while this in turn has resulted in the first-ever application of a fuel-efficient turbocharged four-cylinder in the large albeit still mid-size three-row SUV. 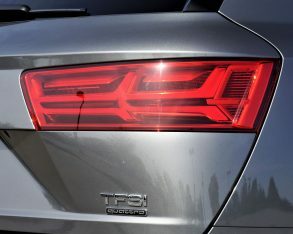 I drove and reported on the 2.0 TFSI equipped Q7 last year and not only found it wholly adequate, but in fact its 252 horsepower and 273 lb-ft of torque felt downright spirited thanks in part to the standard eight-speed automatic and efficient Quattro all-wheel drive system it comes mated to, but for those that make their German engineering choice with an eye on performance first and foremost, I recommend the V6. 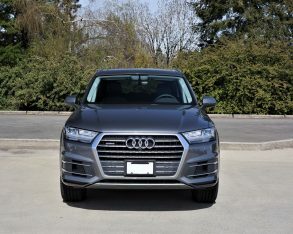 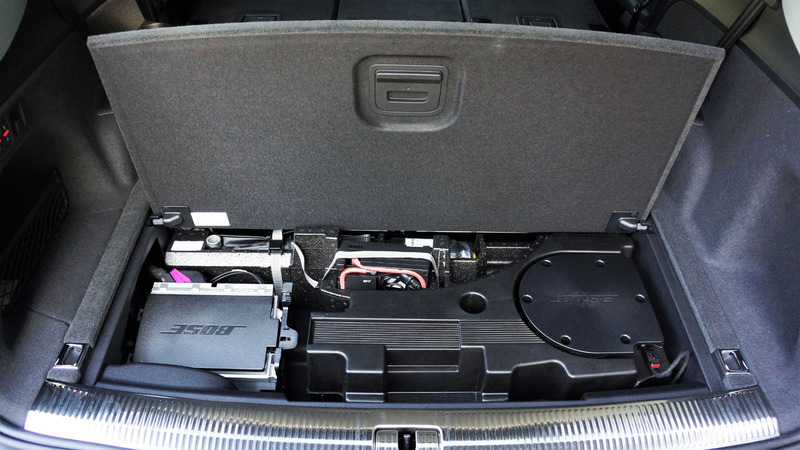 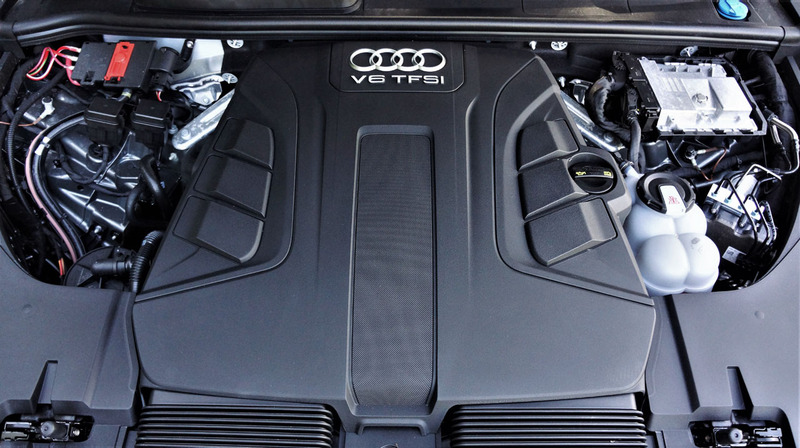 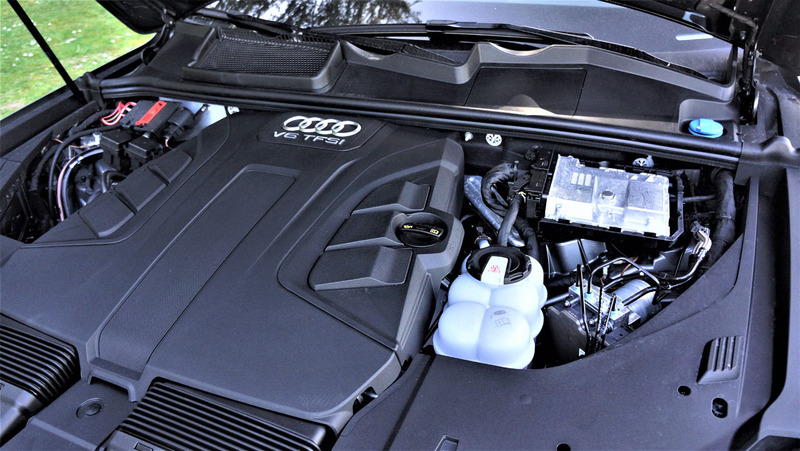 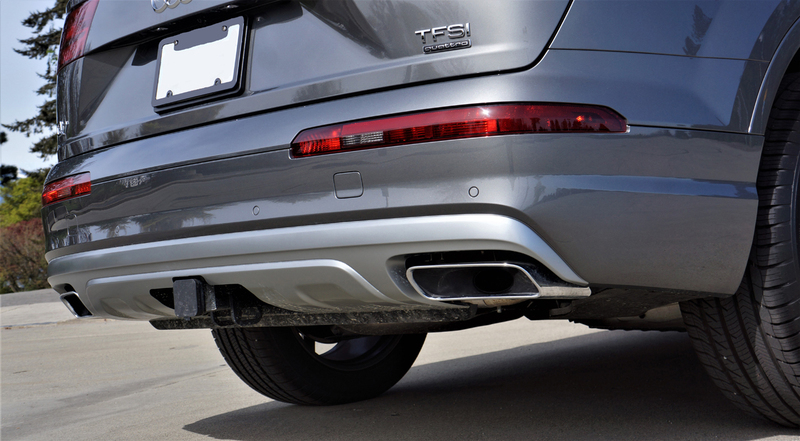 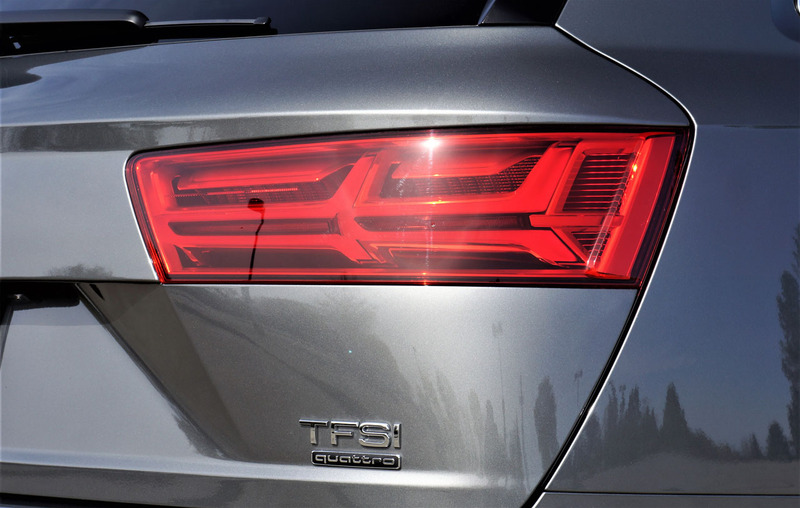 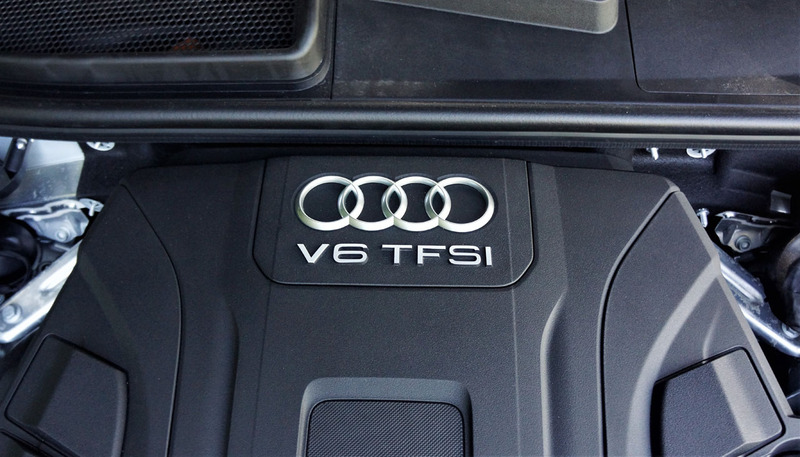 The 2018 Audi Q7 3.0 TFSI Quattro shown on this page felt much the same as a V6-powered model I also tested and reviewed last year, although this variation on the theme didn’t include an upgrade to the $1,800 S Line Sport package, which is really more about cosmetics than performance anyway, due to no sport suspension improvements and identically sized albeit uniquely designed 20-inch alloys on 285/45 all-season tires, restyled front and rear bumpers, an enlarged rear rooftop spoiler, S line fender badges and door sill embellishment on the metal treadplates, and a black headliner inside. 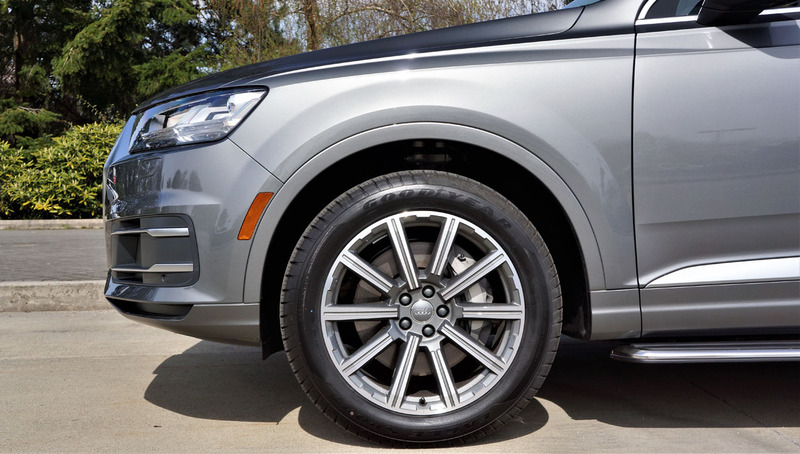 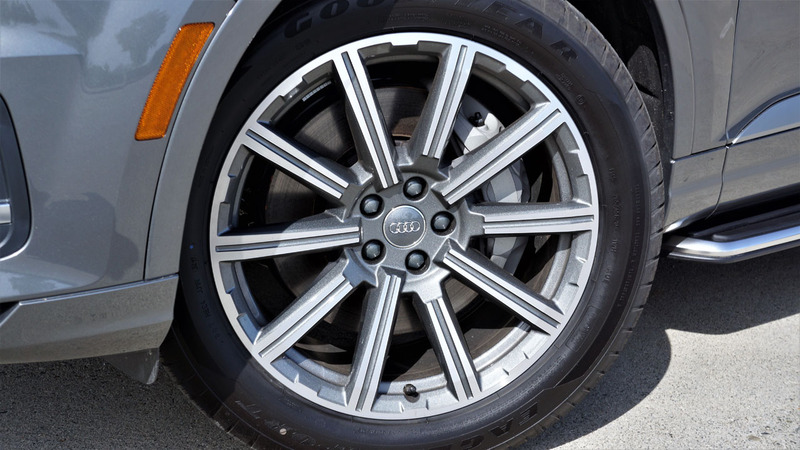 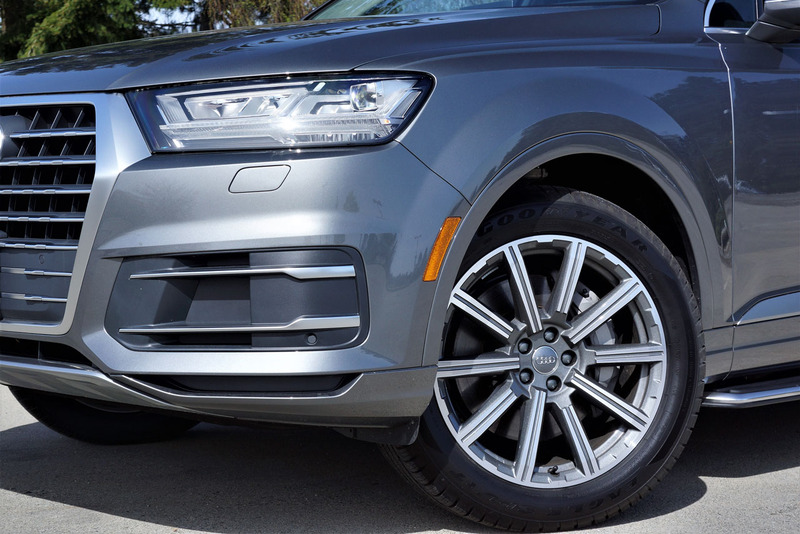 With its visual focus more about luxury than sport, my Q7 loaner still looked suitably planted with its 20-inch 10-spoke Star design alloys, while its two-slat corner vents are hardly less aggressive than the trio of glossy black slats and deeper brake vents provided in S Line trim. 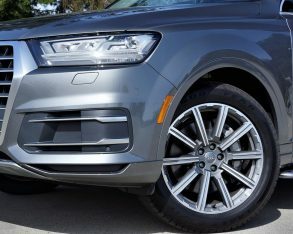 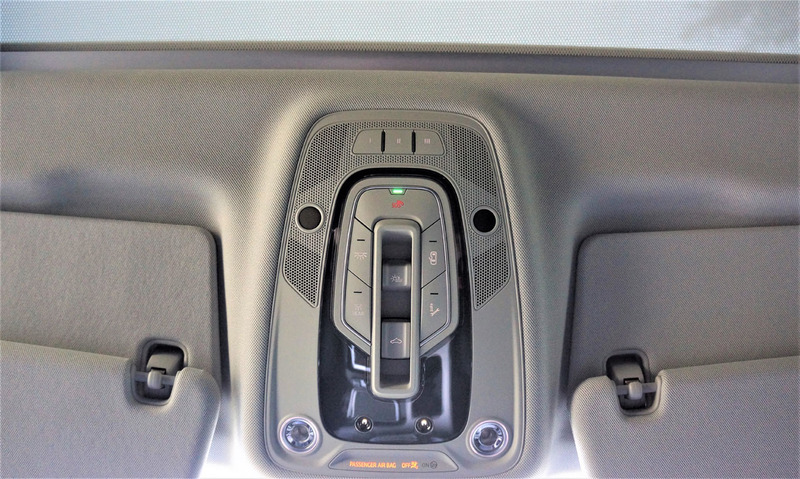 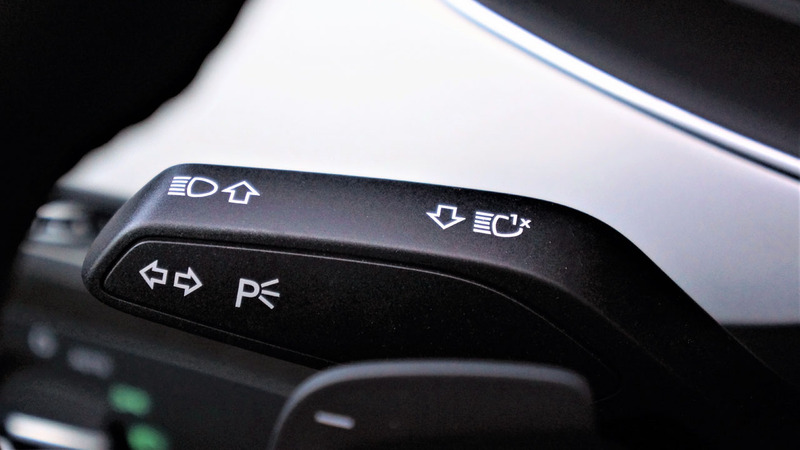 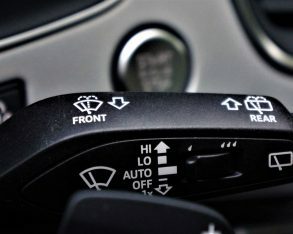 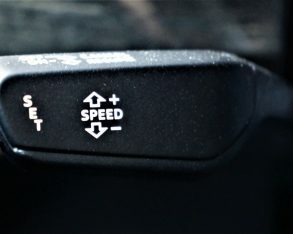 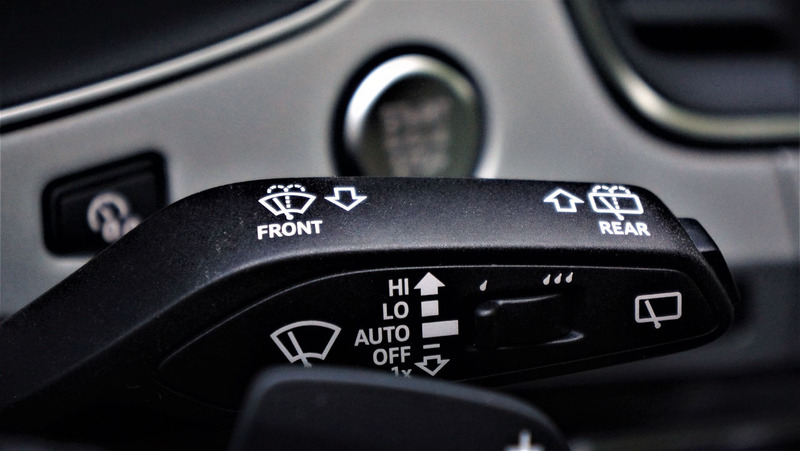 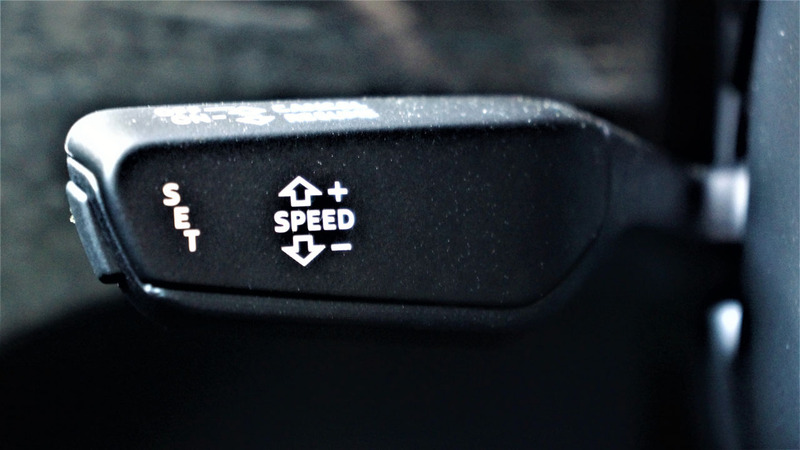 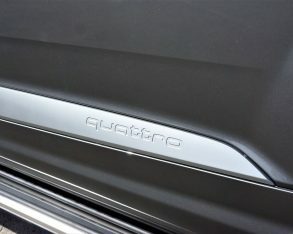 As you might expect, the 2018 Q7 is mostly carryover from last year, this only being the second-gen model’s second year of availability, so therefore the only change this year is the addition of standard Audi side assist blindspot warning and Audi pre-sense rear advanced driver assistance systems to mid-range Progressiv trim, the latter feature using a rear-facing camera to detect and warn of potential rear-end collisions, at which point it mitigates possible injuries by automatically adjusting the seats, tightening the seatbelts, plus closing the windows and sunroof. 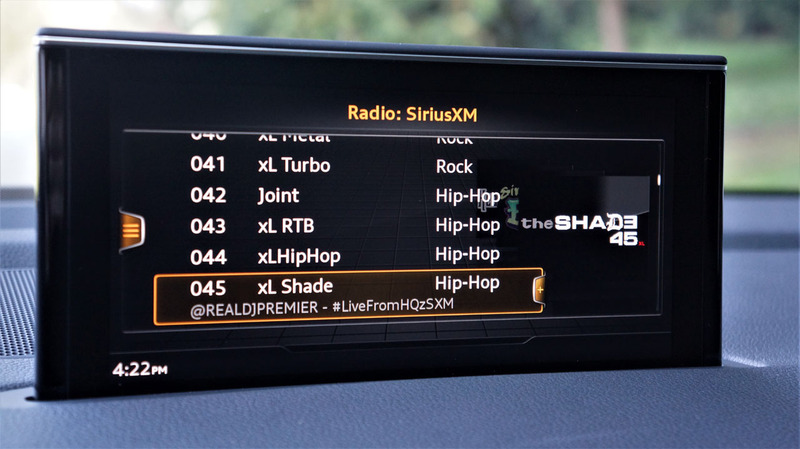 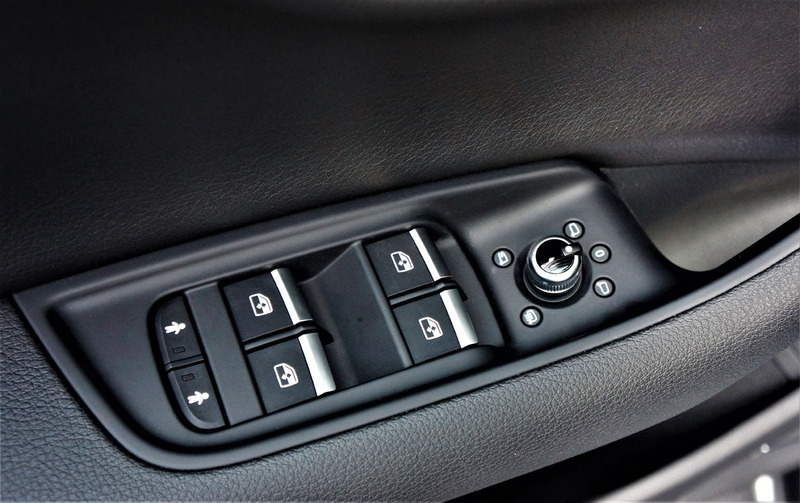 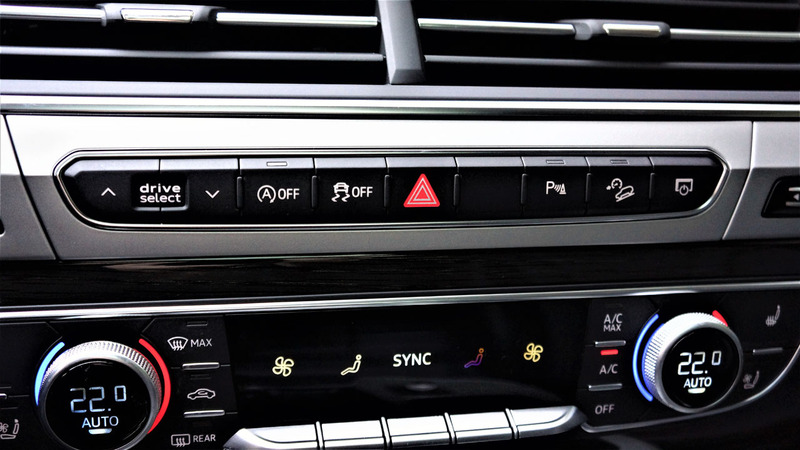 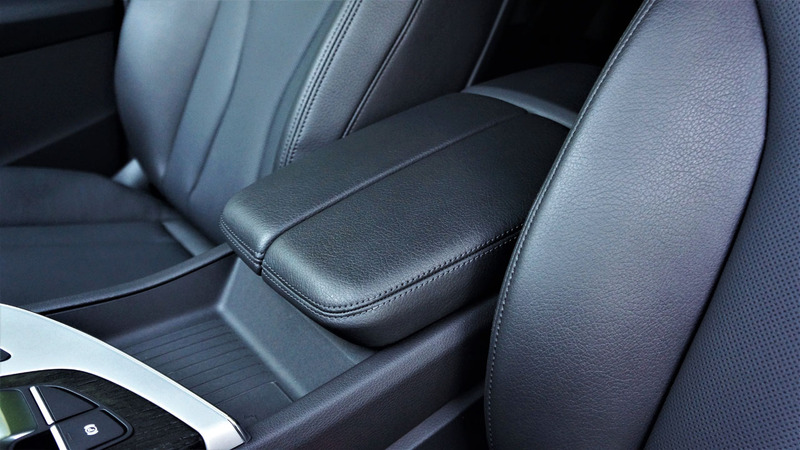 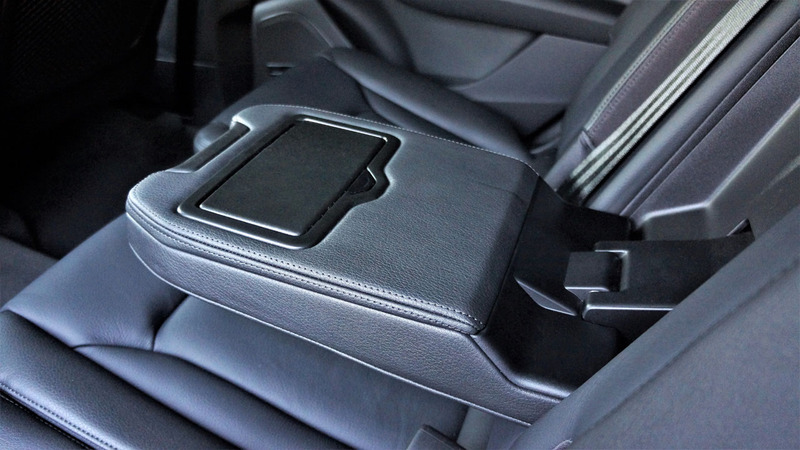 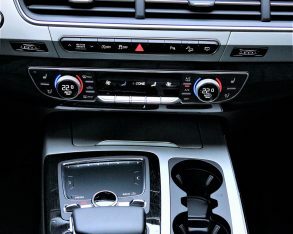 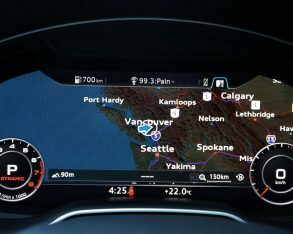 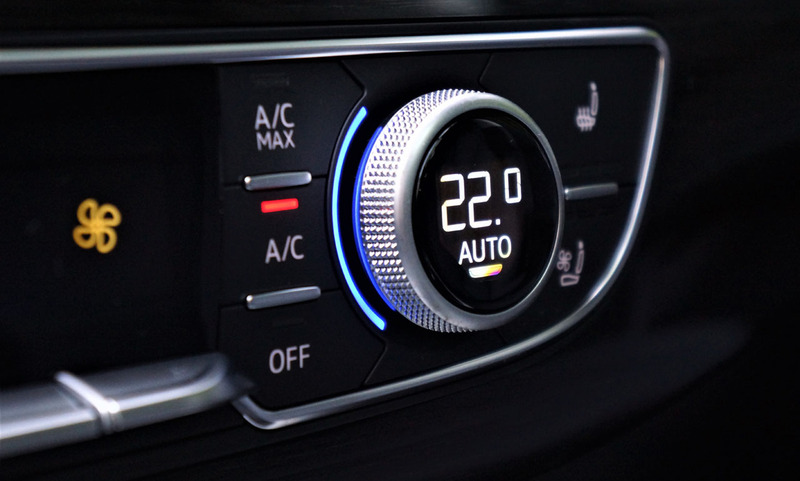 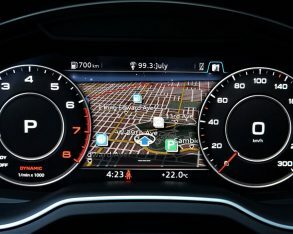 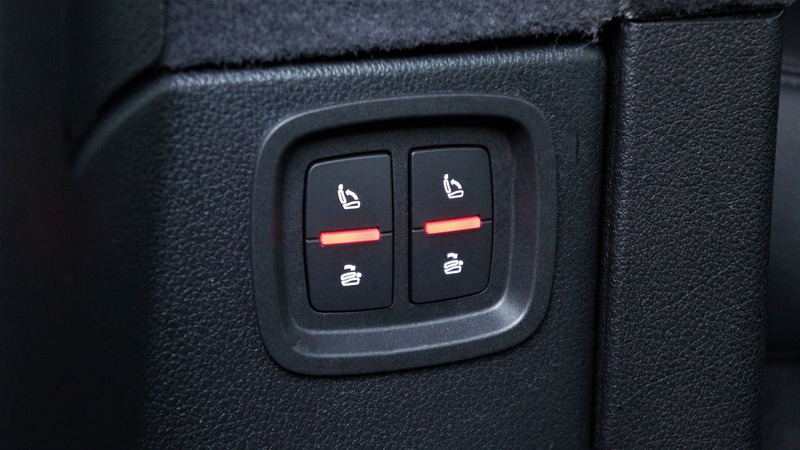 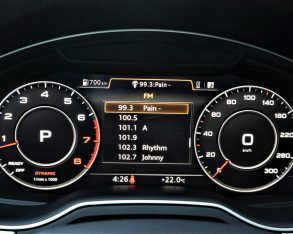 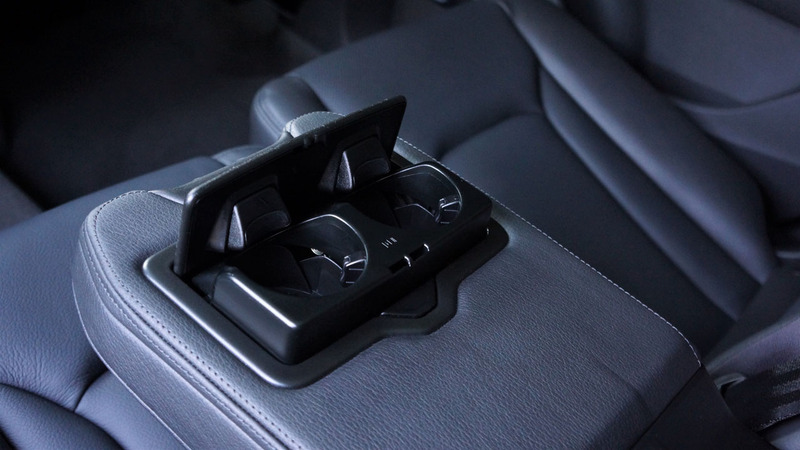 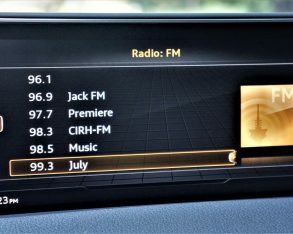 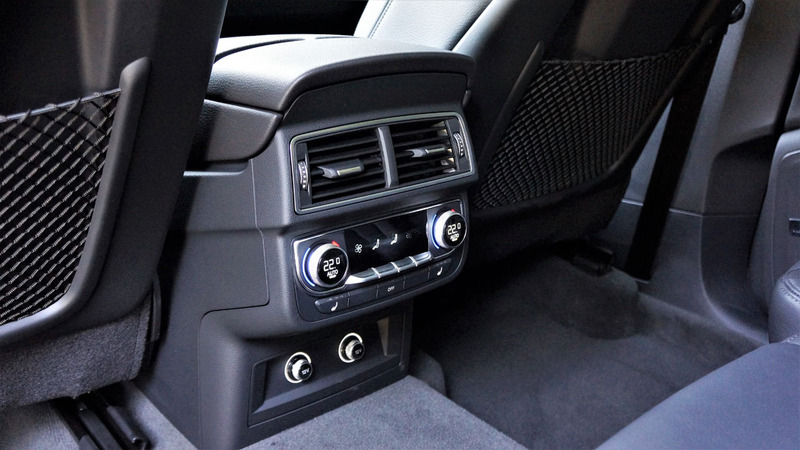 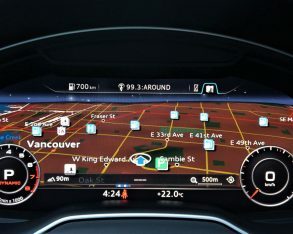 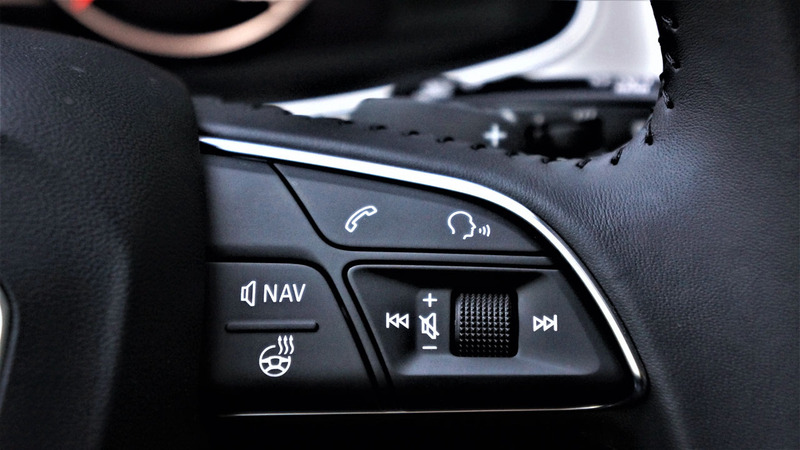 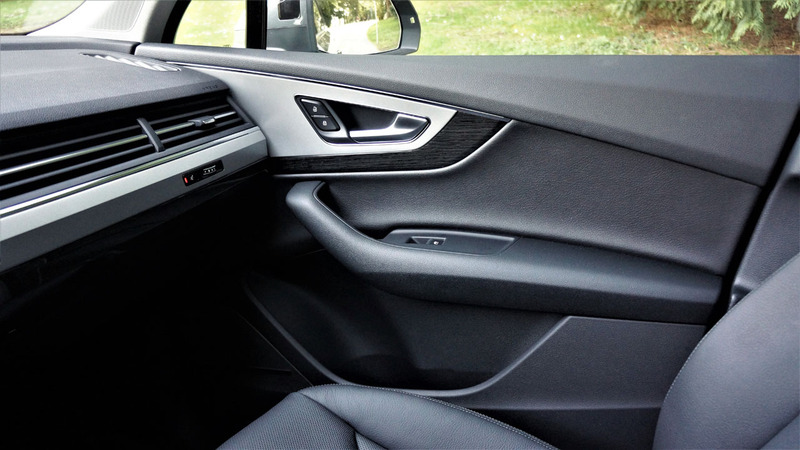 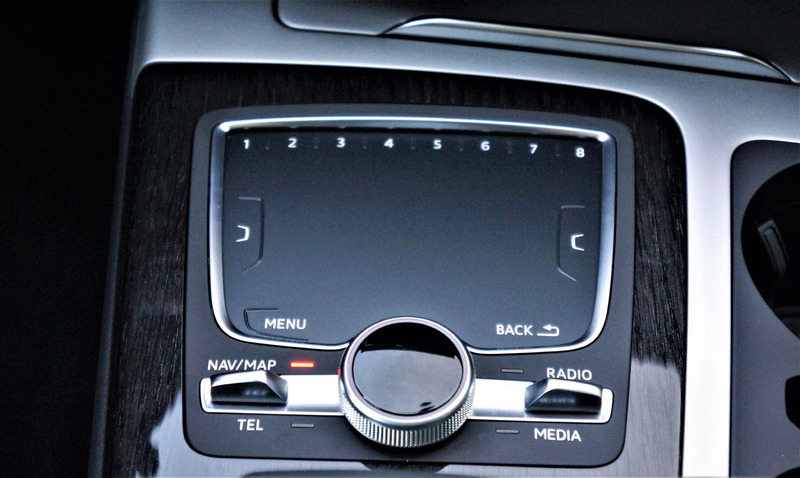 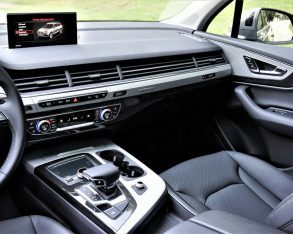 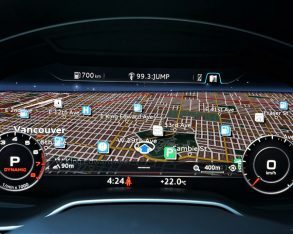 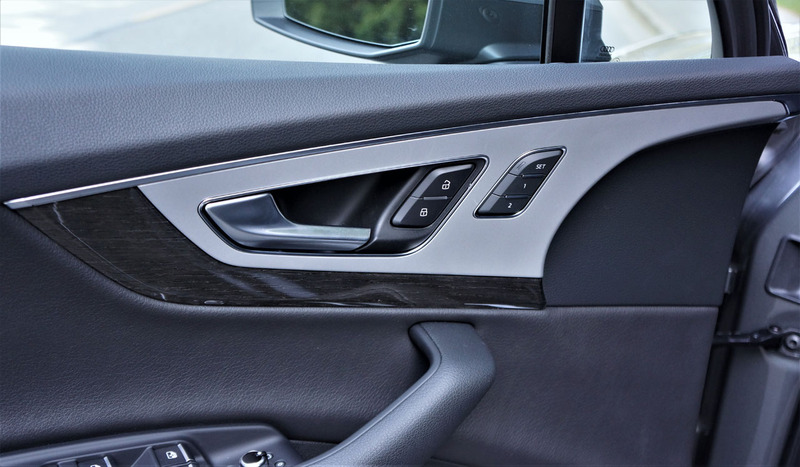 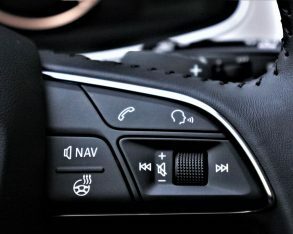 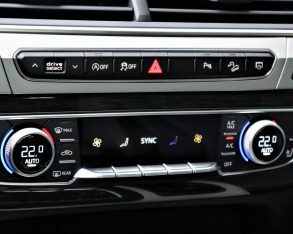 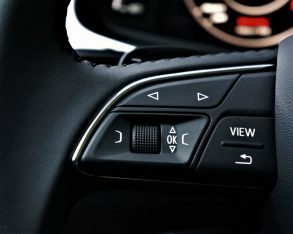 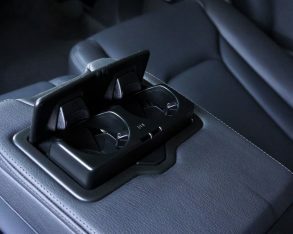 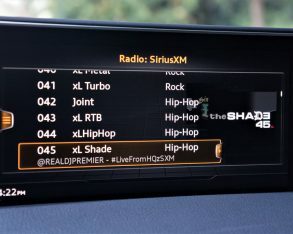 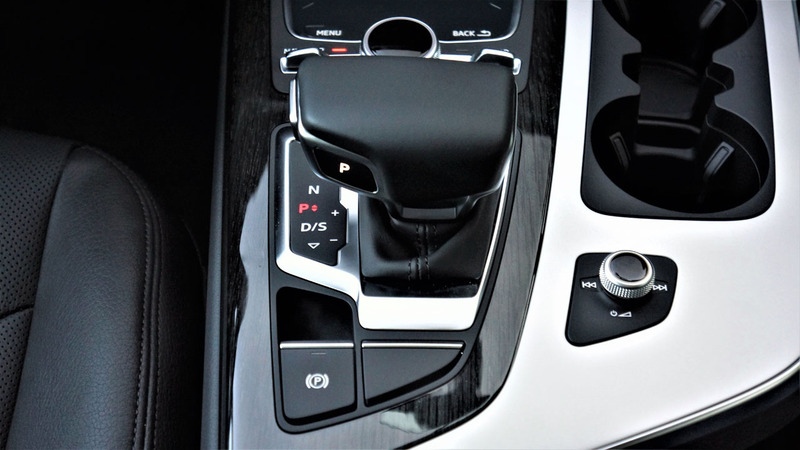 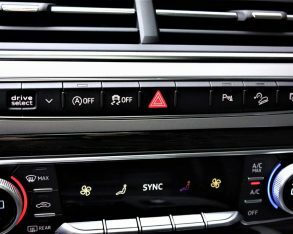 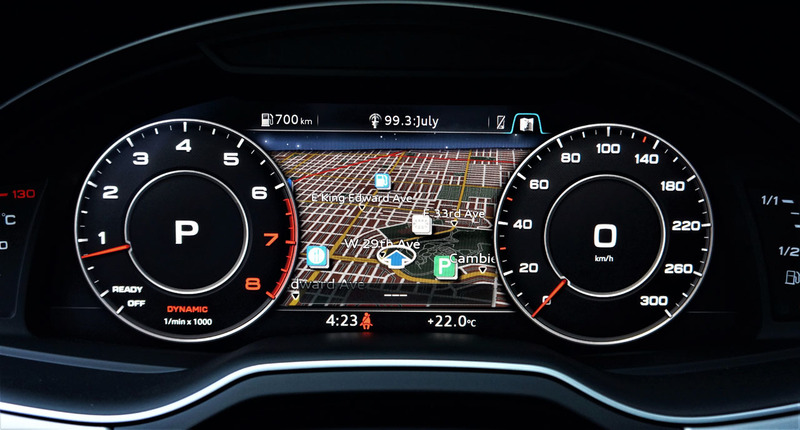 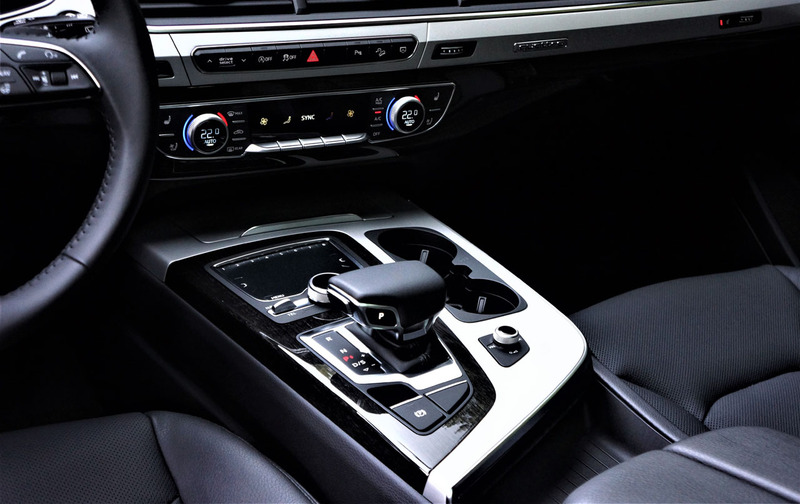 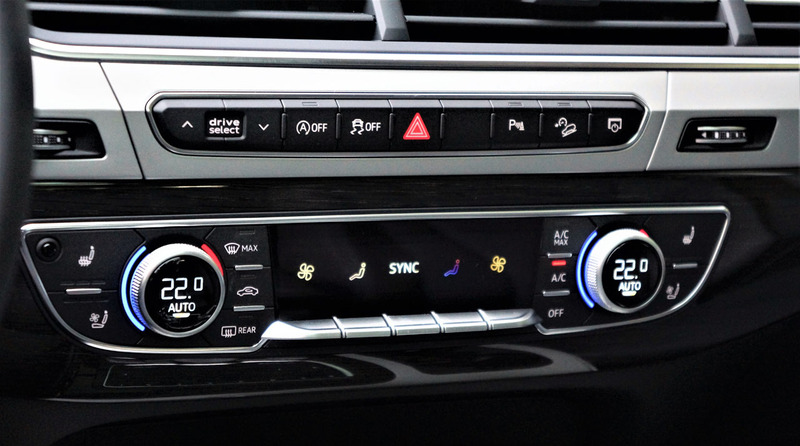 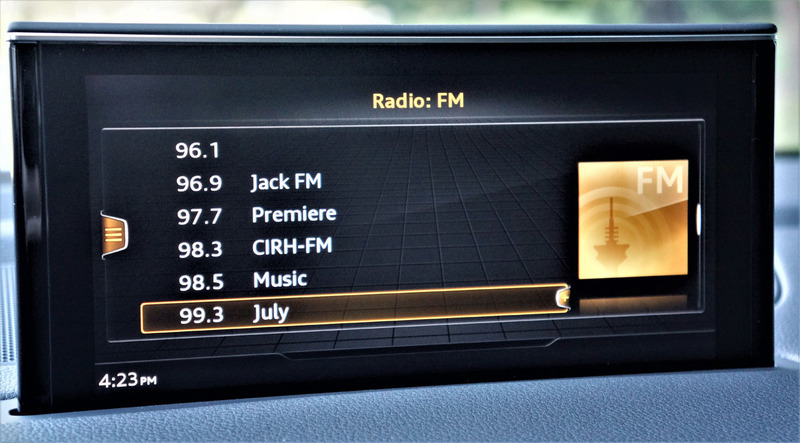 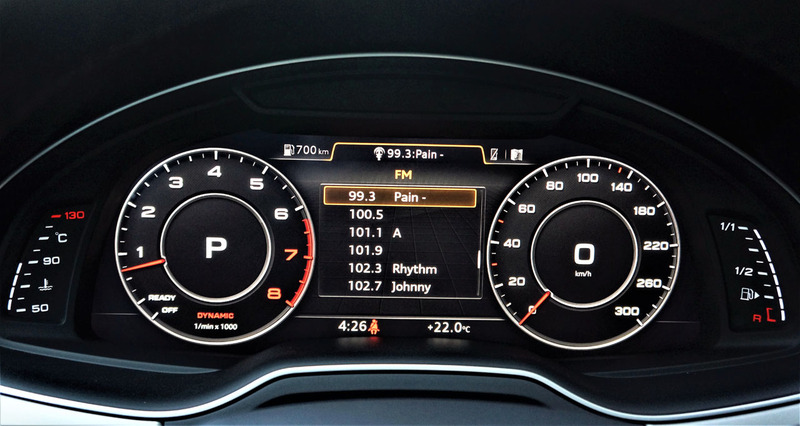 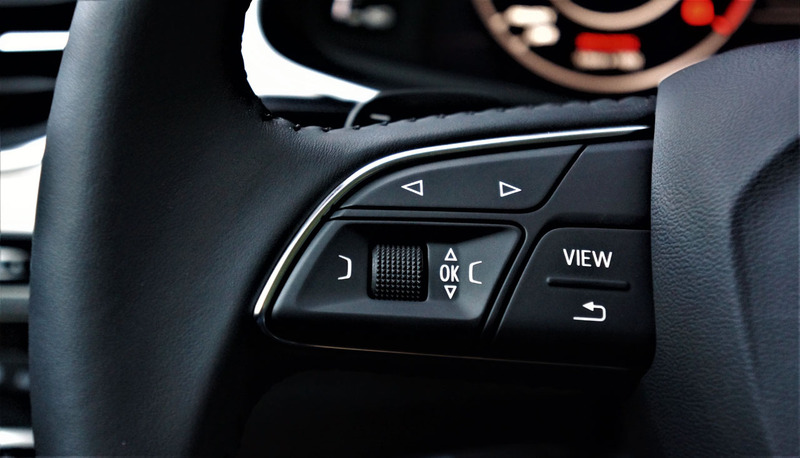 Additionally, as-tested top-line Technik trim now gets the Audi Connect smartphone interface, concierge service, and security features as standard equipment. 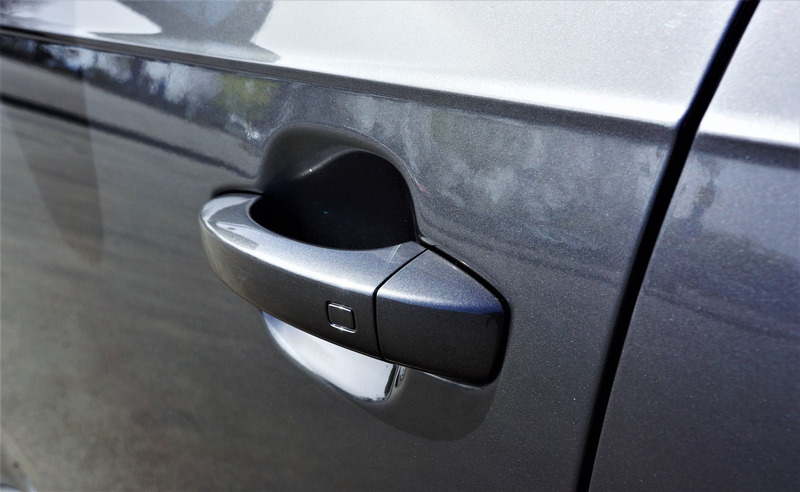 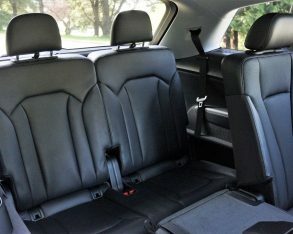 While we’re talking trims, according to CarCostCanada.com that has full pricing by trim level, the dealer’s invoice pricing (wouldn’t it be helpful to know that? 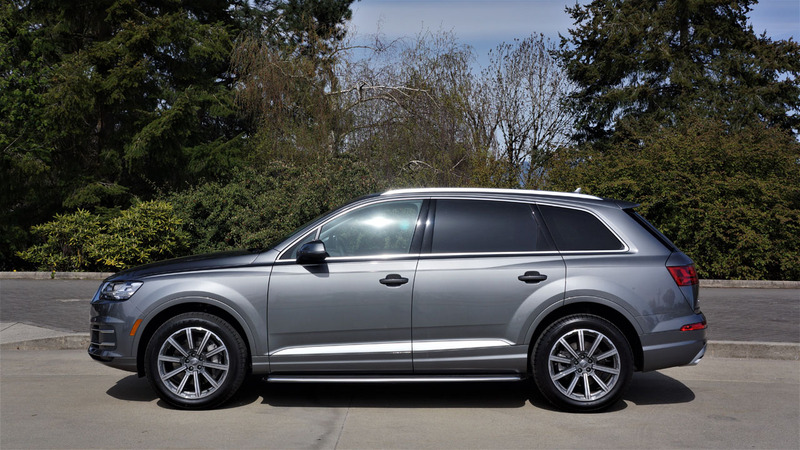 ), and info on available rebates, the Q7 is once again available in three grades including $61,900 Komfort, $67,650 Progressiv and $74,750 Technik. 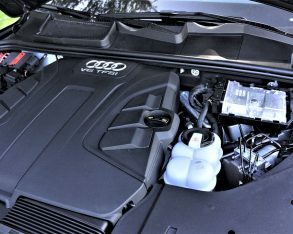 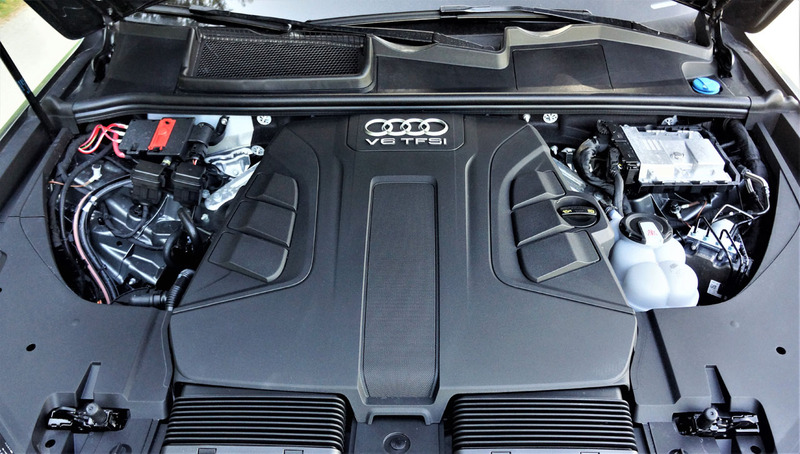 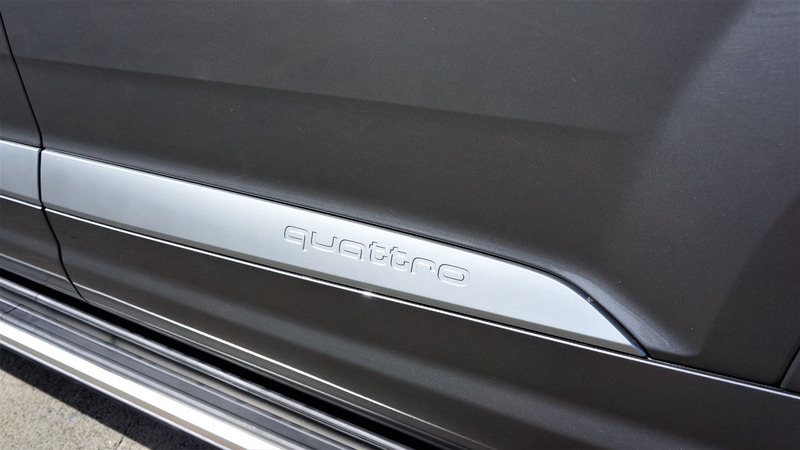 Quattro AWD is standard, while the aforementioned 2.0-litre turbo-four is standard in Komfort and Progressiv trims, while not available with Technik. 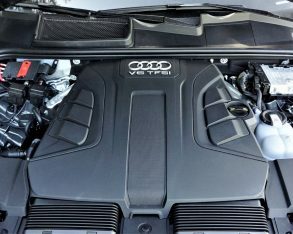 The 3.0-litre supercharged V6 is a $4,000 option in either base or mid-range trim, with the result of this choice being 333 horsepower and 325 lb-ft of torque for considerably stronger straight-line performance, its zero to 100km/h sprint time improved by 1.7 seconds from 7.4 to 5.7 seconds, plus almost no downside in fuel economy as per Transport Canada’s official claimed rating of 12.6 L/100km city, 9.4 highway and 11.1 combined for the V6 and 12.2, 9.5 and 11.0 respectively for the I-4. 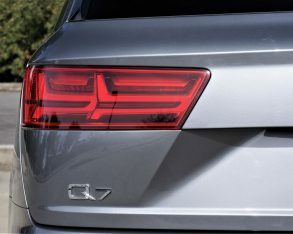 Yes, I know this seems strange, so I found my second witness in the U.S. EPA that shows identical ratings of 19 mpg city, 25 highway and 21 combined no matter the engine tested, which in case you were wondering come very close to our government’s estimates at 12.4 L/100km city, 9.4 highway and 11.2 combined when converted to metric. 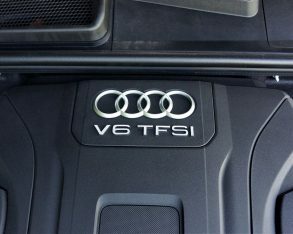 So there you have it, the 2.0 TFSI is more about reducing the Q7’s initial price than ongoing costs. 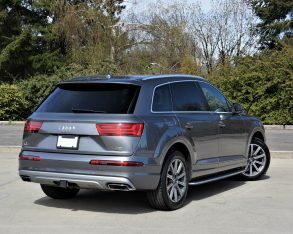 Additionally, with the optional tow package added to both four- and six-cylinder powered Q7s, the latter increases its trailering capacity by more than 1,500 kilos (3,300 lbs) over the former, from 1,995 kilograms (4,400 lbs) to a surprisingly capable 3,500 kg (7,700 lbs). 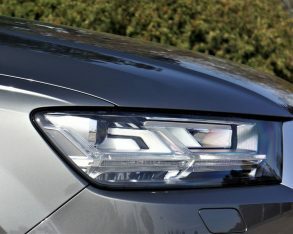 No matter which engine you choose, Komfort trim includes standard self-leveling Xenon plus headlights with washers, LED daytime running lights, LED taillights, 19-inch alloy wheels, heated power-folding side mirrors, stainless steel door sills, pushbutton ignition, a heatable leather-wrapped steering wheel, paddle shifters, an electromechanical parking brake, rain-sensing wipers, Audi Drive Select performance modes, a HomeLink garage door opener, a cooled glove box, heatable eight-way powered front seats with four-way powered driver’s lumbar support, driver-side memory for the seat and side mirrors, leather upholstery, genuine oak hardwood, piano black lacquer and real aluminum interior trim, tri-zone automatic climate control, a large infotainment display that powers up from within the dash top, HD and satellite radio, a powered panoramic glass sunroof with an electric sunshade, a powered liftgate, a retractable cargo cover, 50/50-split power-folding third-row seatbacks, front and rear parking sensors, engine stop-start, regenerative braking, and Audi’s pre-sense basic driver assistance system that detects when an emergency manoeuvre is being made and then initiates all of the crash preventative measures noted earlier about pre-sense rear. 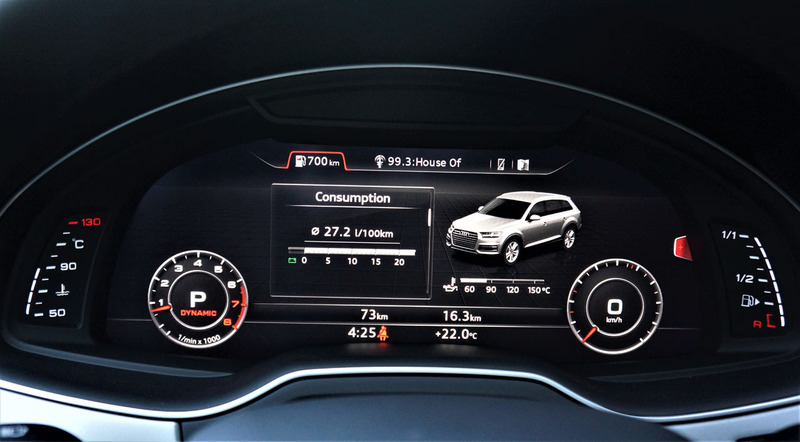 My Technik tester included all of the above, plus everything from mid-range Progressiv trim such as its proximity-sensing keyless access, auto-dimming centre and side mirrors, blindspot warning, power-adjustable steering column, Audi Virtual Cockpit fully digital 12.3-inch TFT gauge cluster, 360-degree Topview surround parking camera, aforementioned smartphone integration, navigation, additional rear zone for the climate control system, four-way powered front passenger lumbar, ventilated front seats, heatable rear outboard seats, stainless steel trunk sill protection, virtual pedal proximity-sensing trunk release, and more. 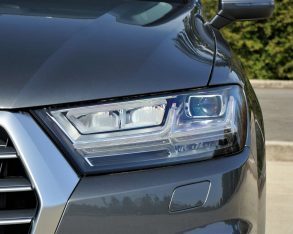 Lastly, exclusive Technik features include full LED headlamps for much brighter nighttime drives, a larger set of 20-inch alloys on 285/45 all-season run-flats for better grip, a sensational sounding 3D Surround Sound Bose audio system with 19 speakers and 558 watts of power, Audi connect assistance and security services, and more. 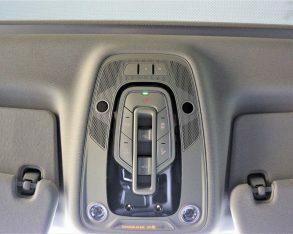 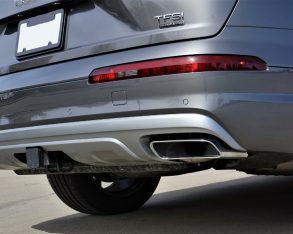 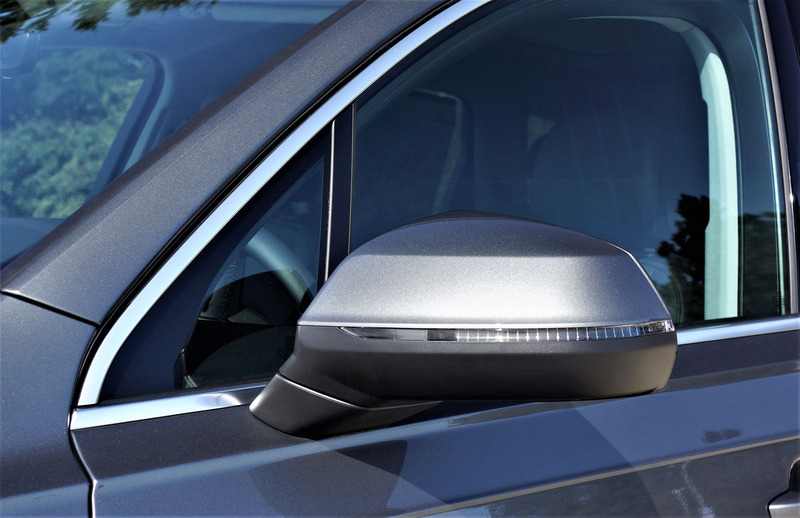 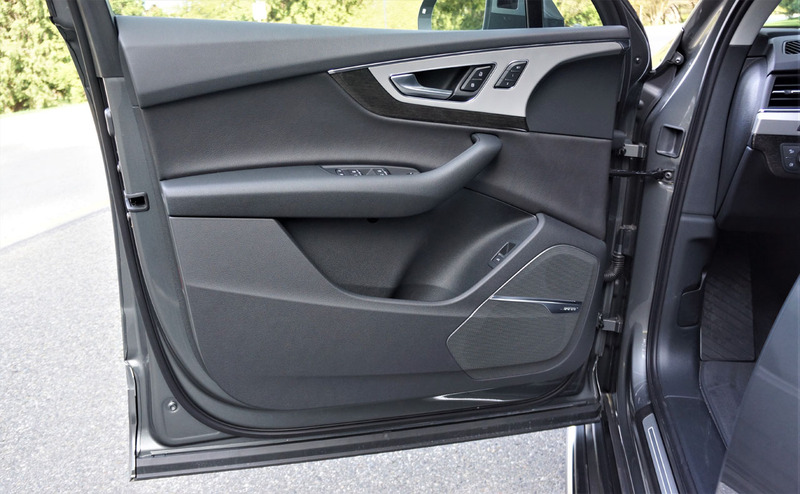 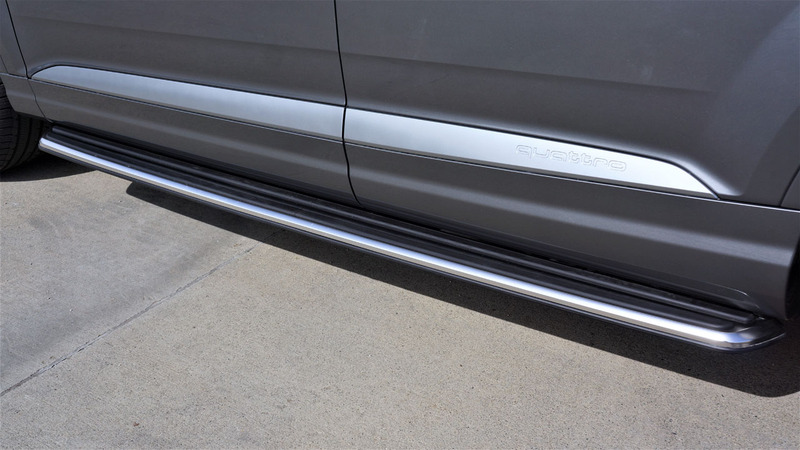 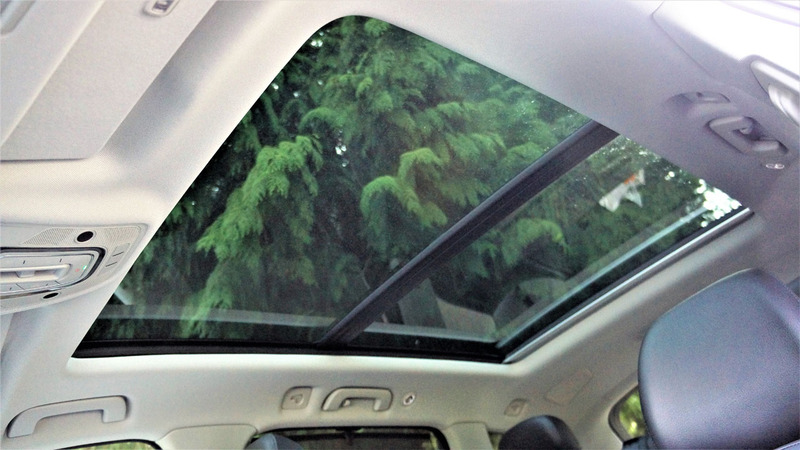 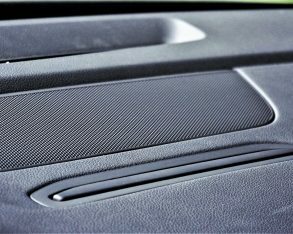 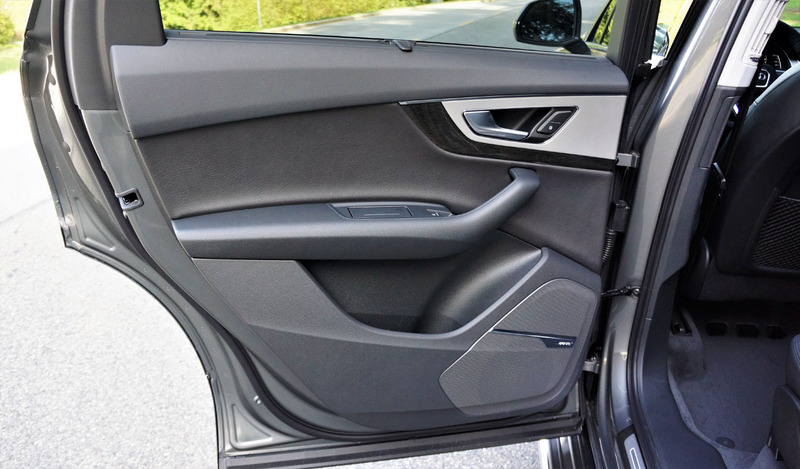 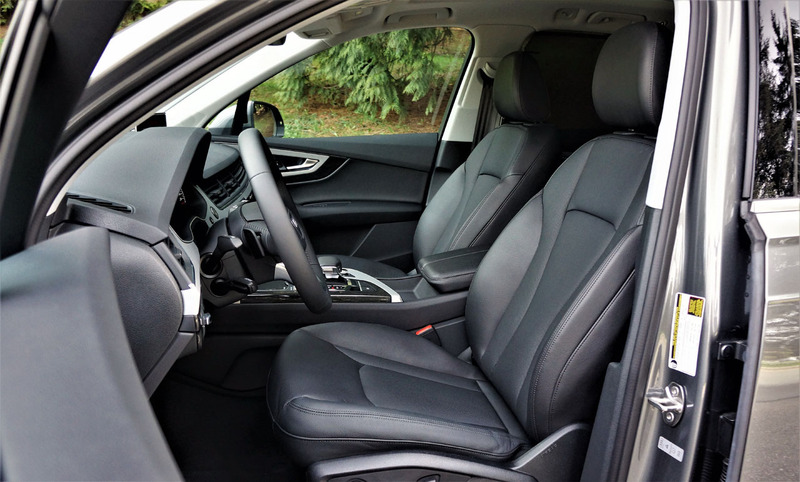 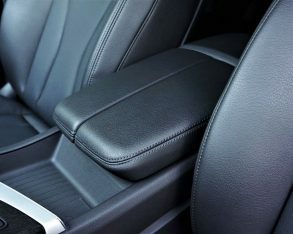 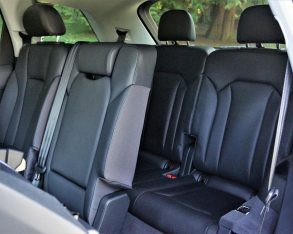 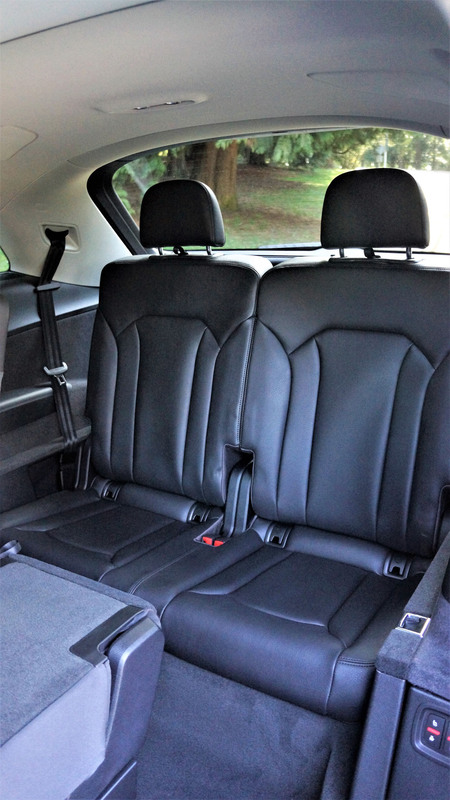 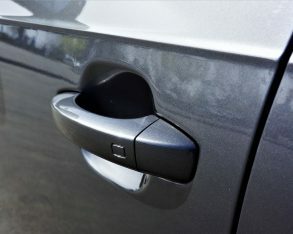 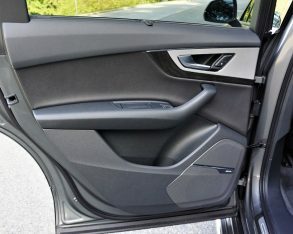 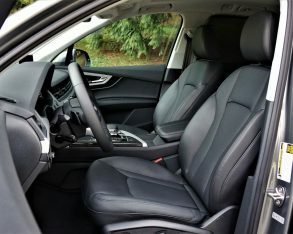 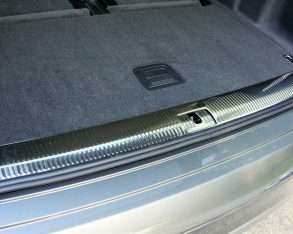 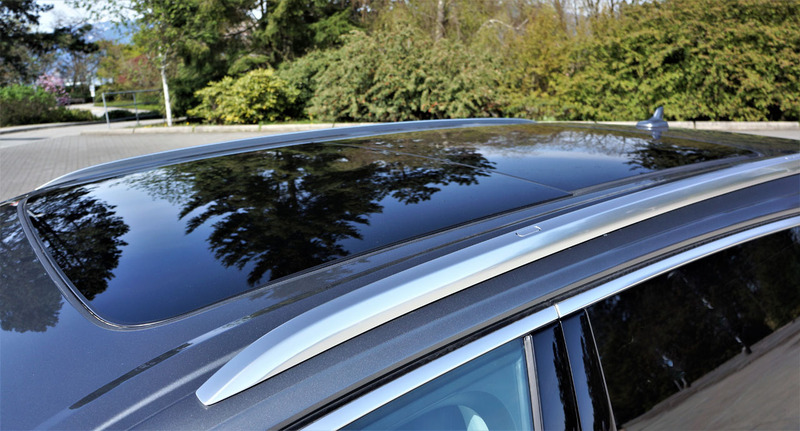 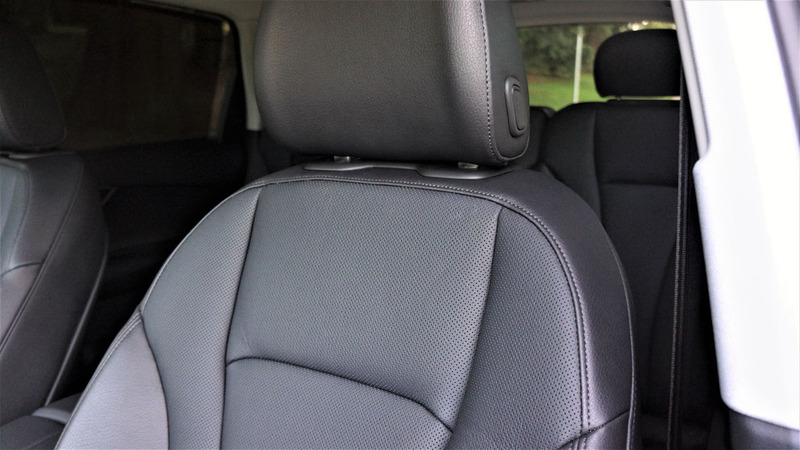 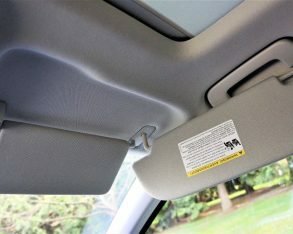 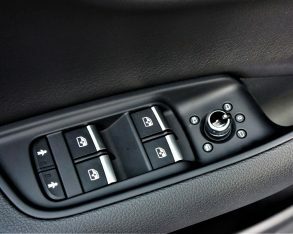 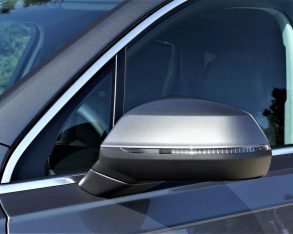 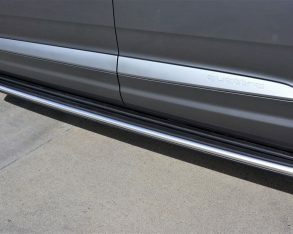 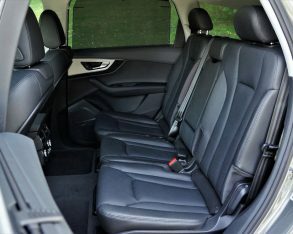 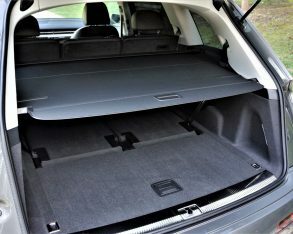 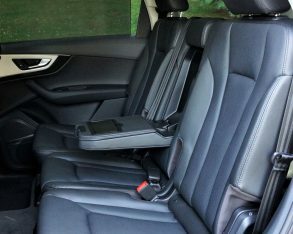 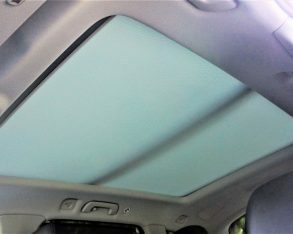 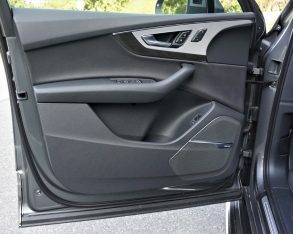 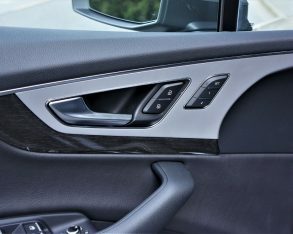 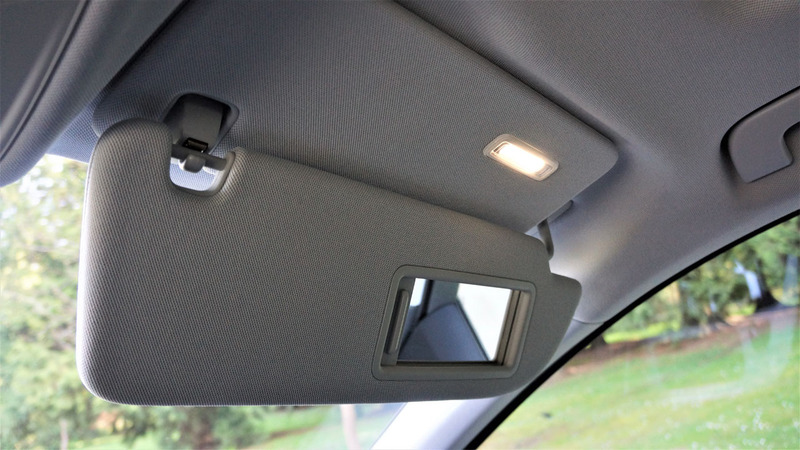 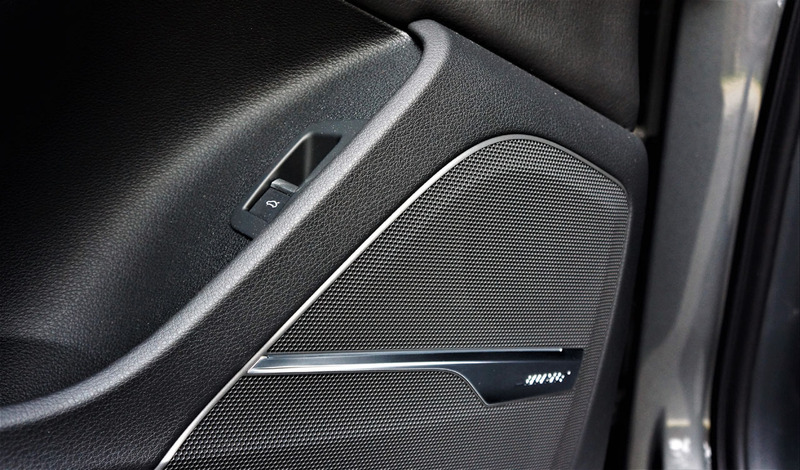 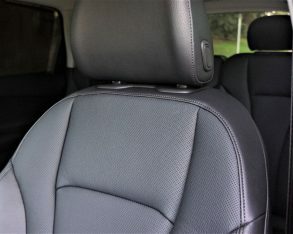 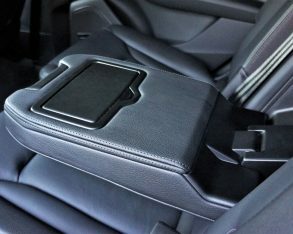 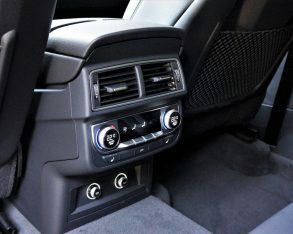 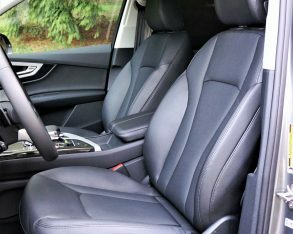 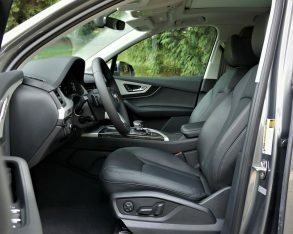 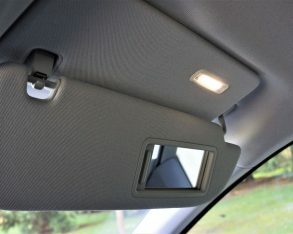 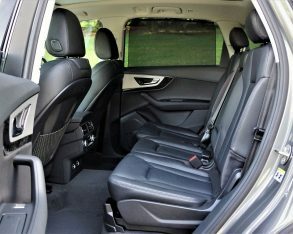 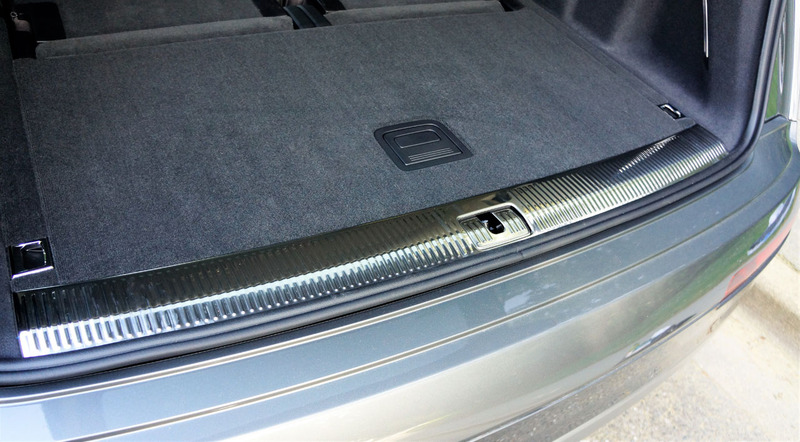 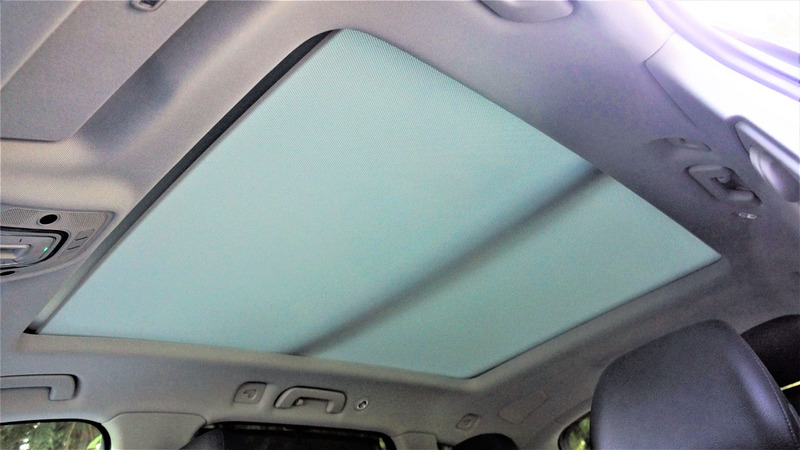 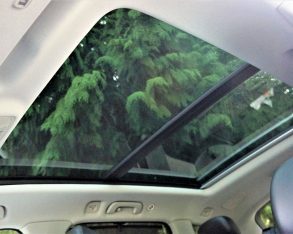 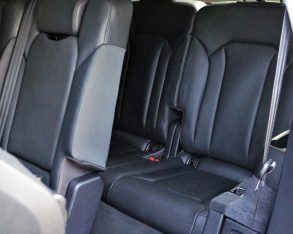 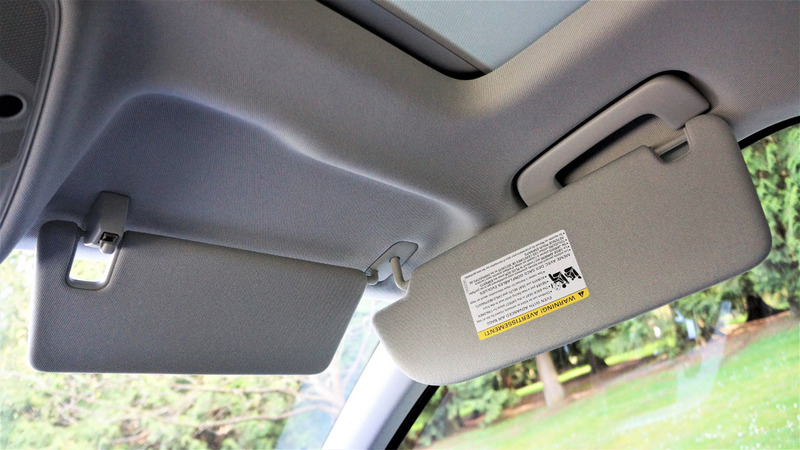 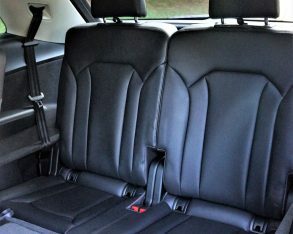 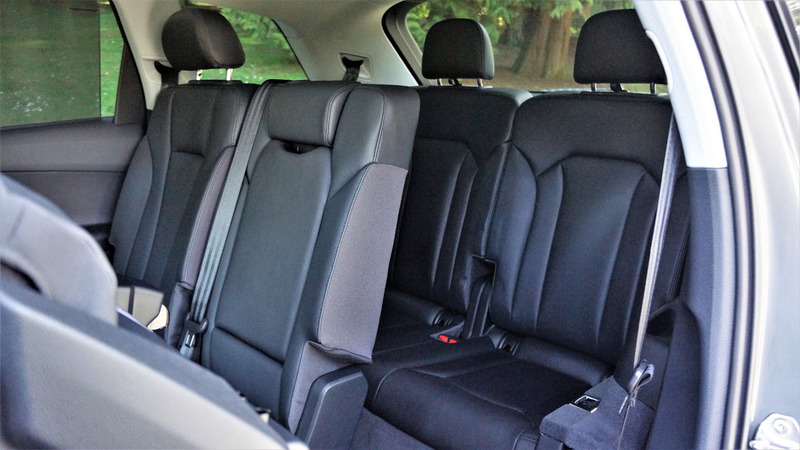 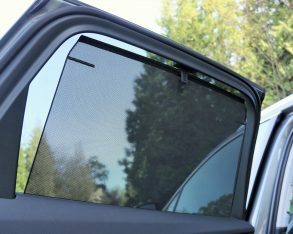 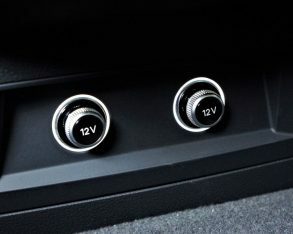 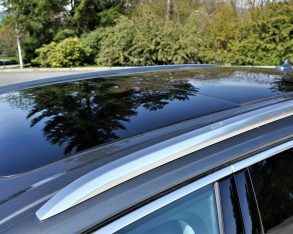 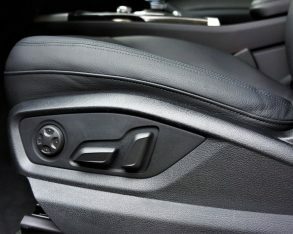 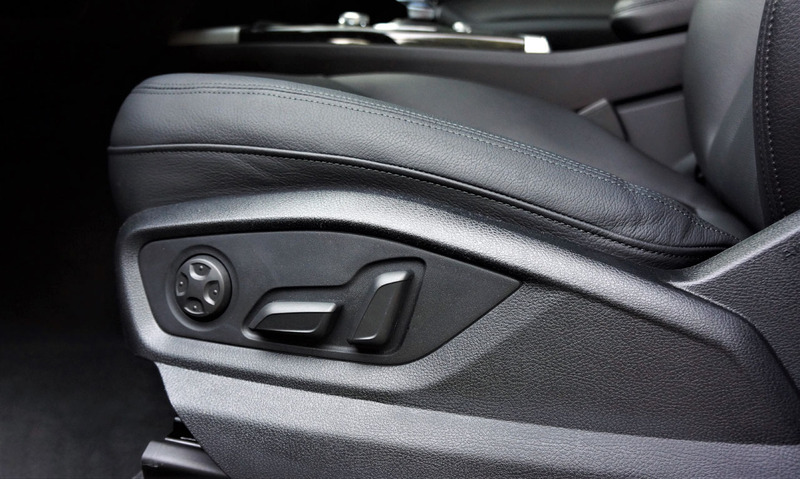 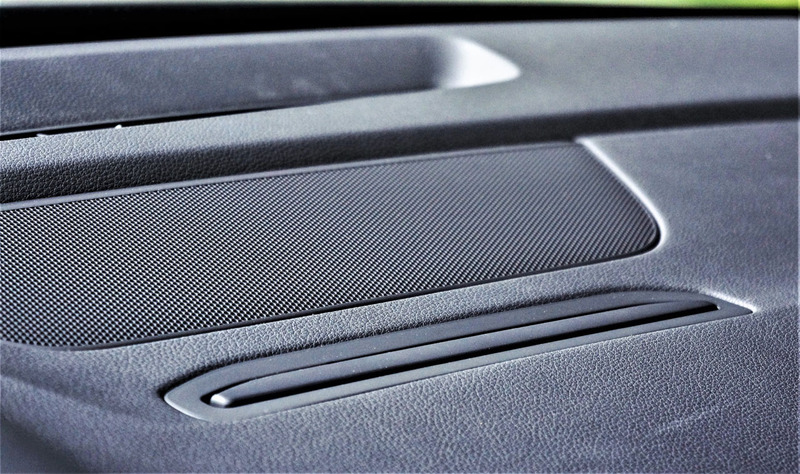 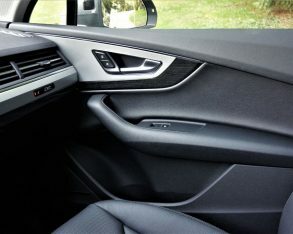 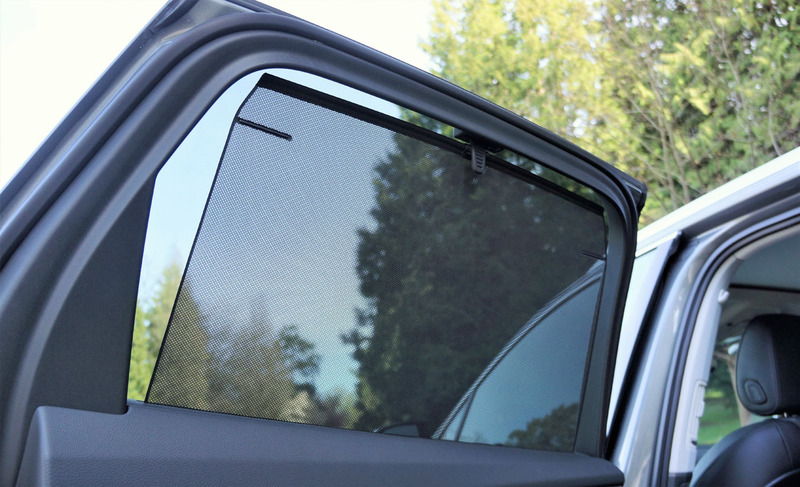 Of course, some of the features that come standard with Technik trim can be had in option packages and as standalone upgrades within each trim level, while my tester was also enhanced further with a $150 set of second-row side window sunshades, which are ideal if you have sun-sensitive passengers in back. 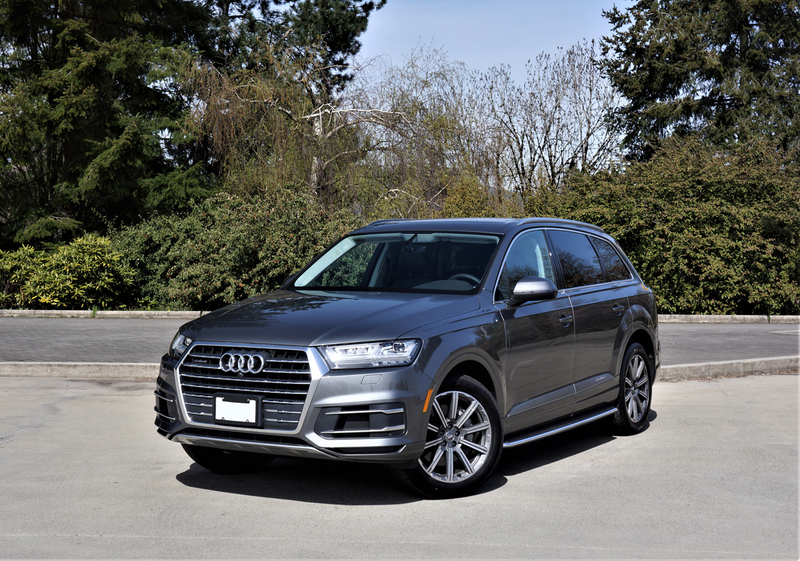 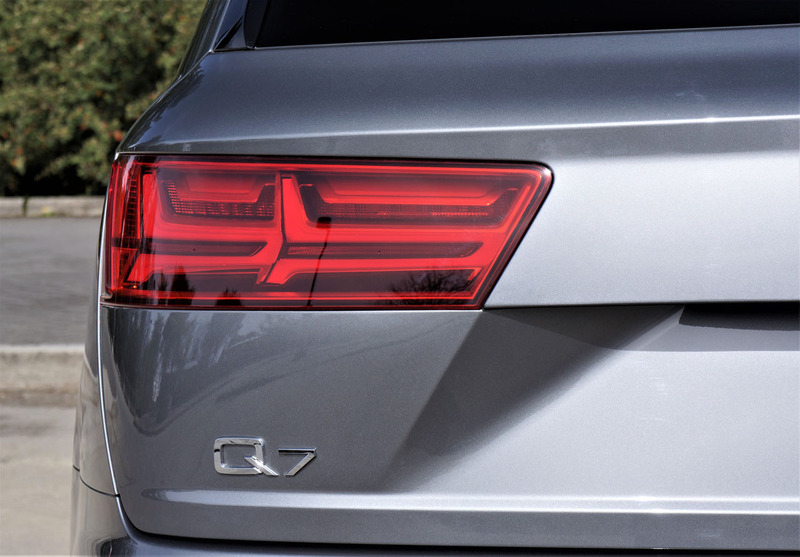 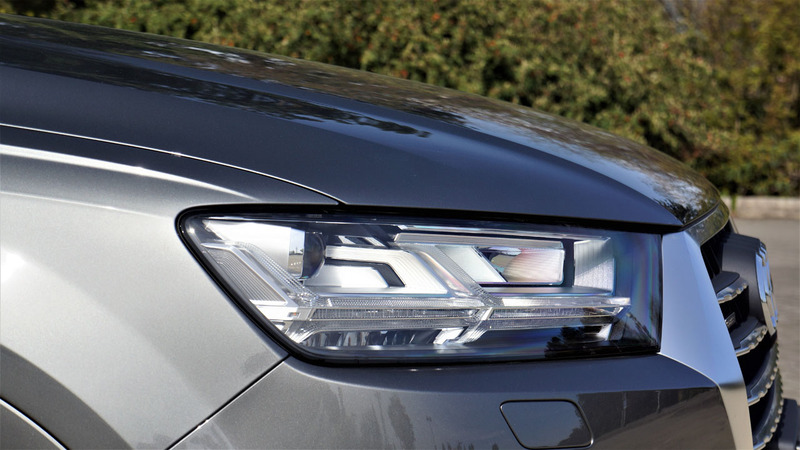 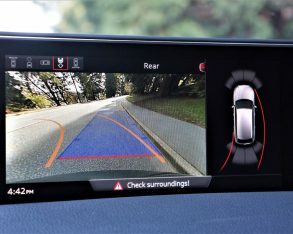 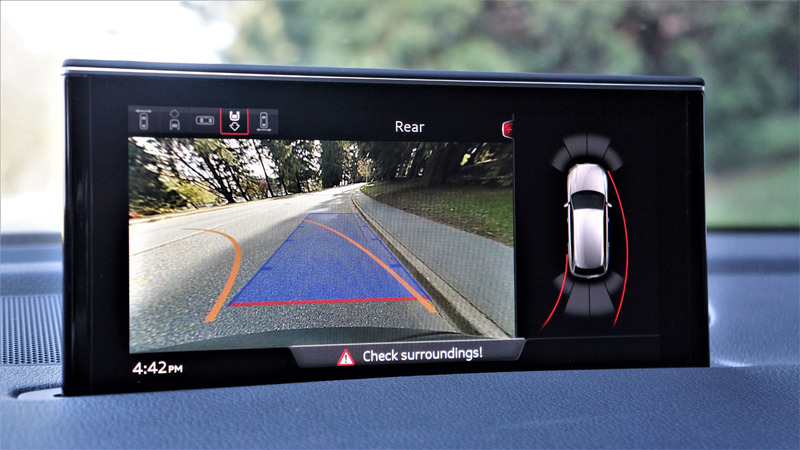 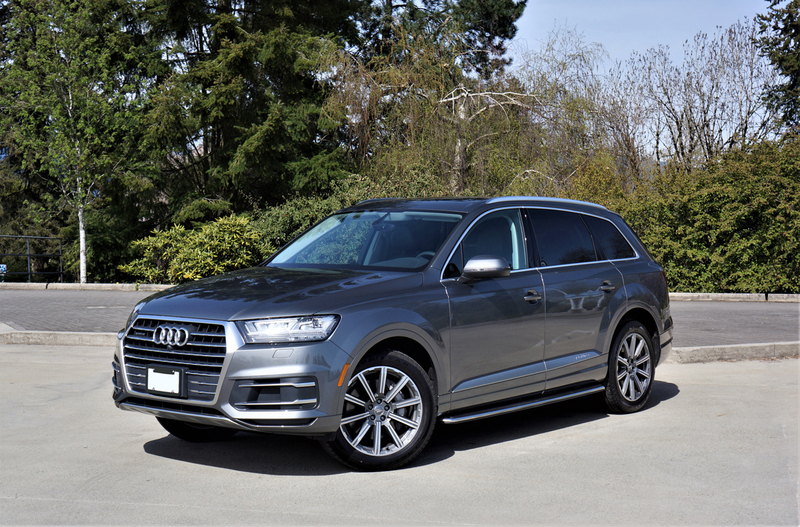 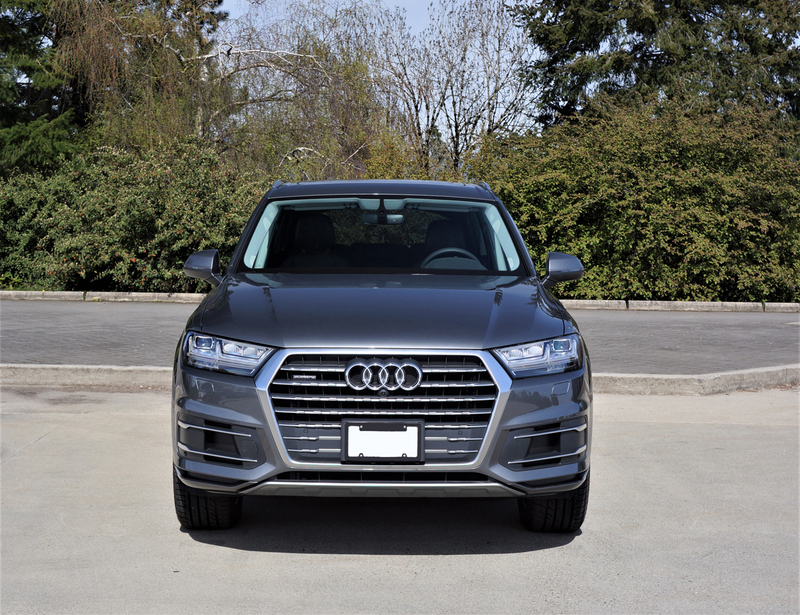 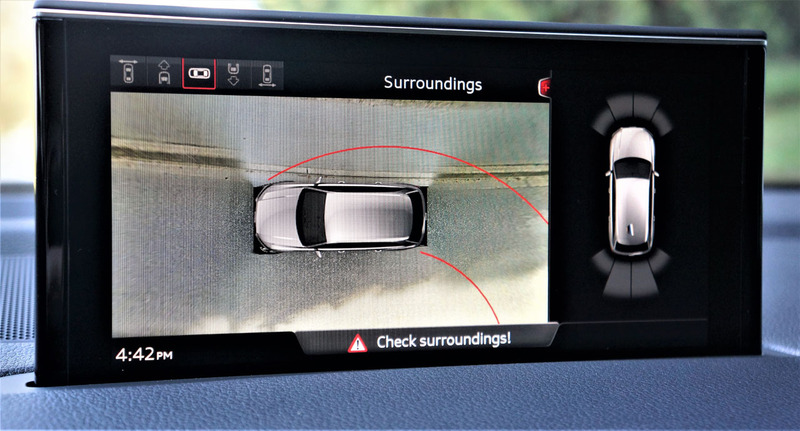 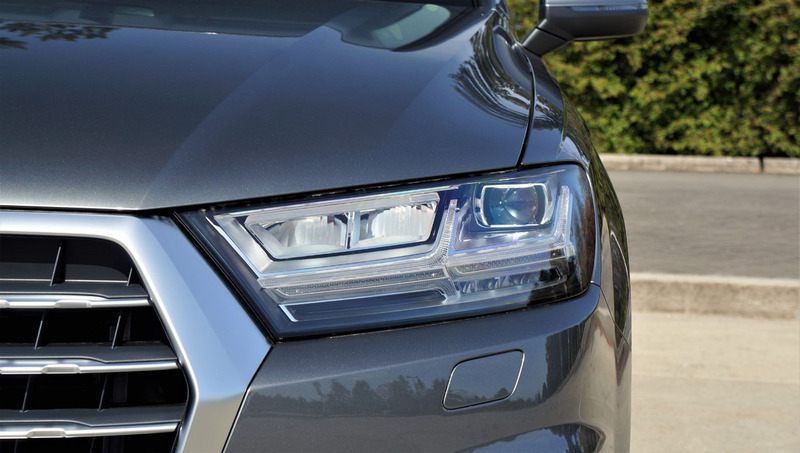 I’d find it difficult to believe many Q7s are ordered without the $900 Driver Assistance Package too, which includes auto high beam assist, a camera and distance sensor, Audi active lane assist, and traffic sign recognition. 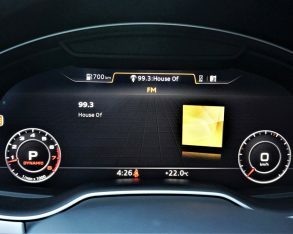 If this were to become my personal ride I’d be even more tempted to add the $3,400 Driver Assistance Plus package due to its adaptive cruise control with stop and go alone, while this suite of advanced safety features includes a head-up display projecting key info onto the windscreen ahead of the driver, Audi pre sense plus, Audi pre sense city front collision warning with autonomous braking, and traffic jam assist, a semi-autonomous steering feature that does the driving for you while stuck on well-paved congested roadways at speeds from 0 to 65 km/h. 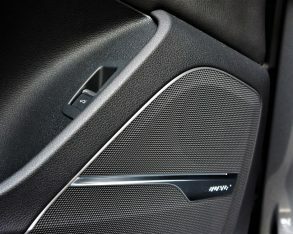 My tester’s standard Diamond finish upper inlay with Silver Grey and Oak Grey lower inlays, can be replaced by three $500 alternatives that all include Brushed Aluminum for the upper inlay with either Oak Grey, Beaufort Walnut, or Walnut and Terra Brown for the lower inlay, while the already excellent Bose audio system can be traded in for an even more impressive $5,100 Bang & Olufsen system with tweeters that power up out of the dash and many other advanced audio technologies. 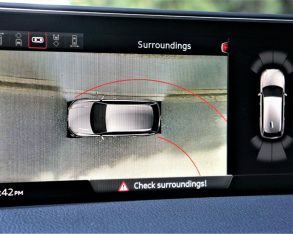 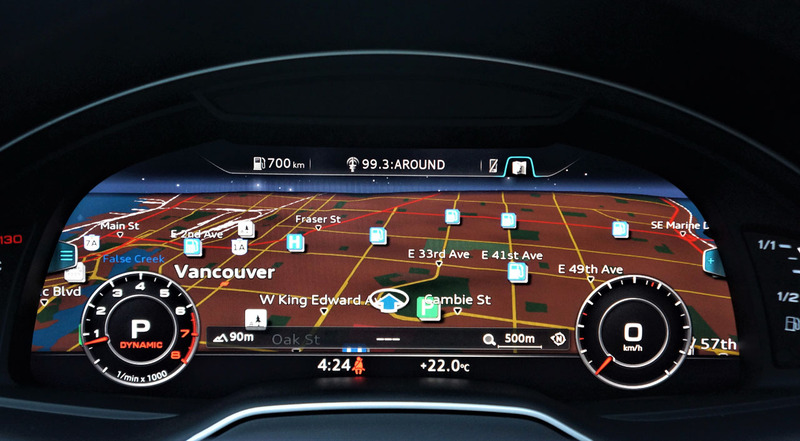 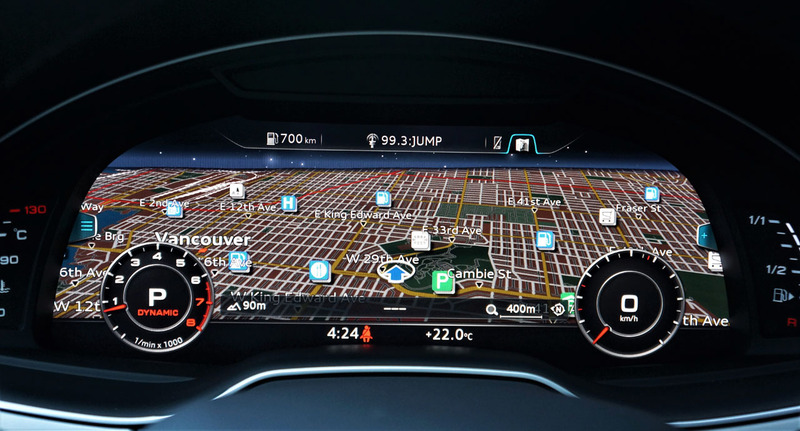 Additionally, a $2,500 Night vision assistant uses a thermal imaging camera to scan 15 to 90 metres ahead for pedestrians and large animal heat signatures and then projects them onto the multi-information display in the gauge cluster, while other options include massaging front seats, a dual screen rear seat entertainment system, rear side-impact airbags, a bevy of wheels and tires and more, plus dealer installed accessories galore. 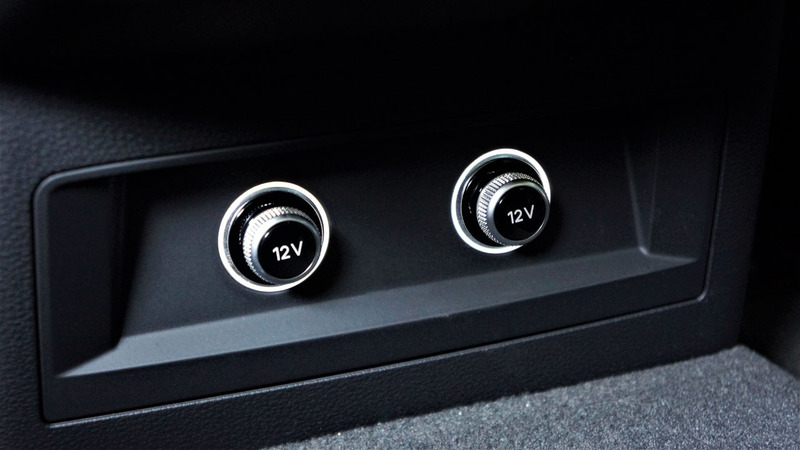 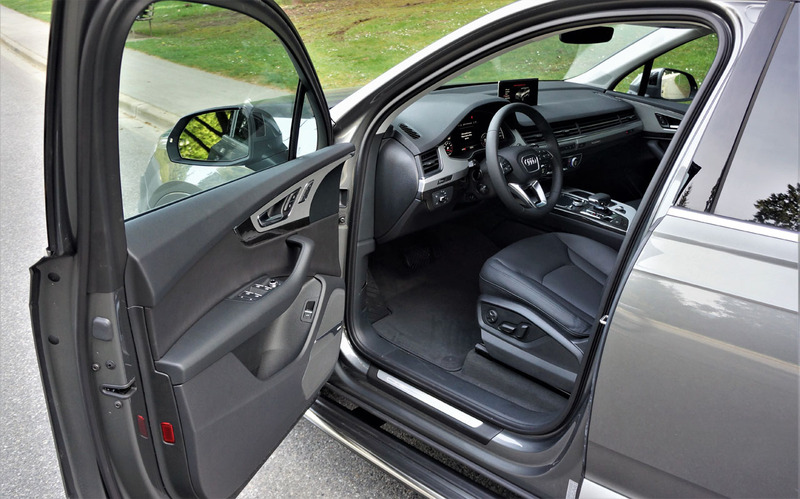 Naming off options and standard equipment might help put the Q7’s value proposition into a better light, but it hardly relates the experience of actually spending time inside. 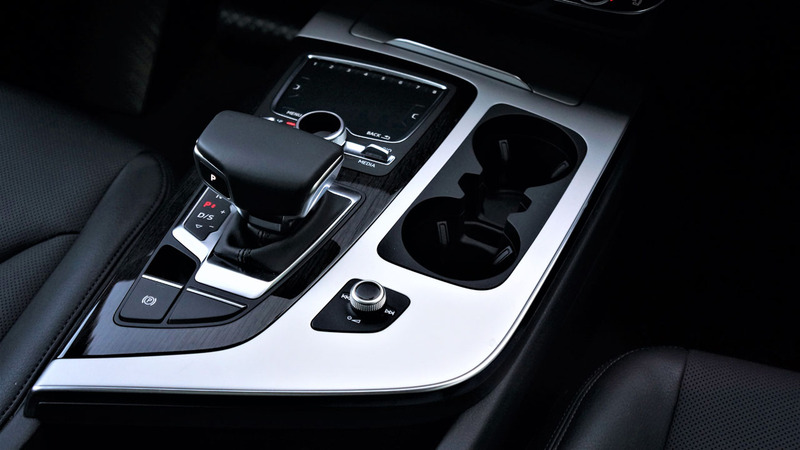 It remains one of the best interiors in its class thanks to Audi’s pleasing horizontal design mixed with fine attention to detail. 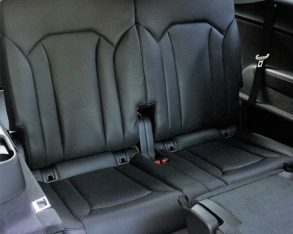 The quality of workmanship and materials chosen are difficult to match in this class, and the overall layout, ease of use, and general comfort comes close to perfection. 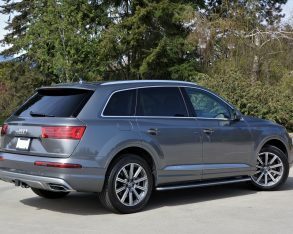 The Q7 may excel even further above most peers in driving dynamics, by somehow balancing a gentle ride with superb handling. 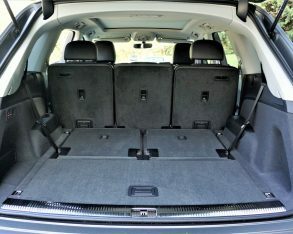 I’m always amazed at how small the Q7 feels when at the wheel, as if it’s outwardly sized a category down from its true three-row mid-size dimensions, but numbers don’t lie and your rear passengers won’t complain about being cramped, although it’s so much fun to drive that backseat drivers may ask you to slow down. 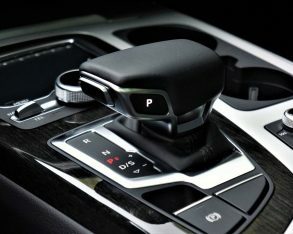 The Q7’s speed-sensing electric power-assist steering feels just right and responds to input quickly and accurately, while the SUV’s fully independent double wishbone front and multi-link rear suspension system absorbs all the nasty road imperfections yet still manages to stay glued to the road even when pushed much harder than you might think possible. 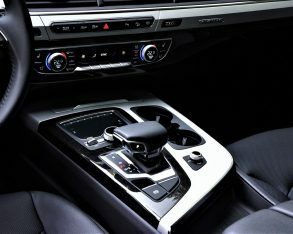 Audi may have found the ideal compromise between sport and comfort, as I never felt like I was giving up either. 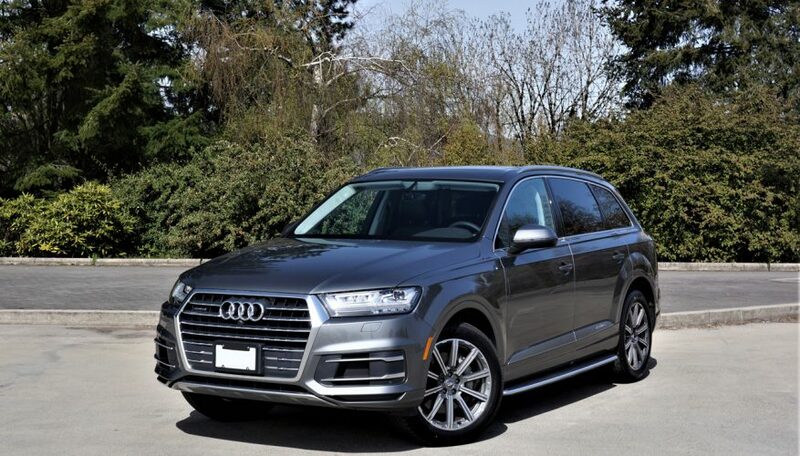 Added to this is Quattro AWD for all-season confidence, a system that has saved me from snow covered ski hill parking lots and launched me out of even deeper snow banks plenty of times, and would no doubt be just as capable of dealing with muddy cottage backroads, etcetera. 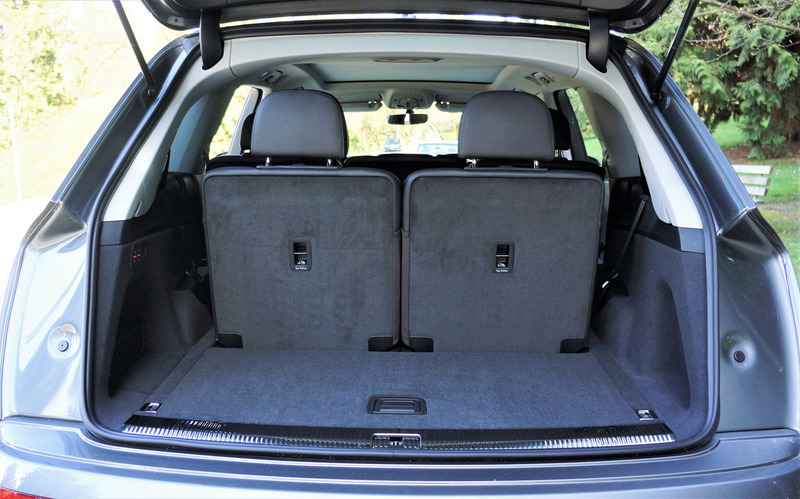 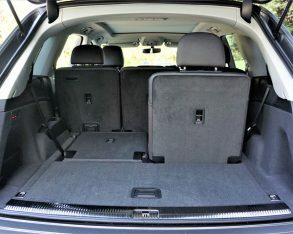 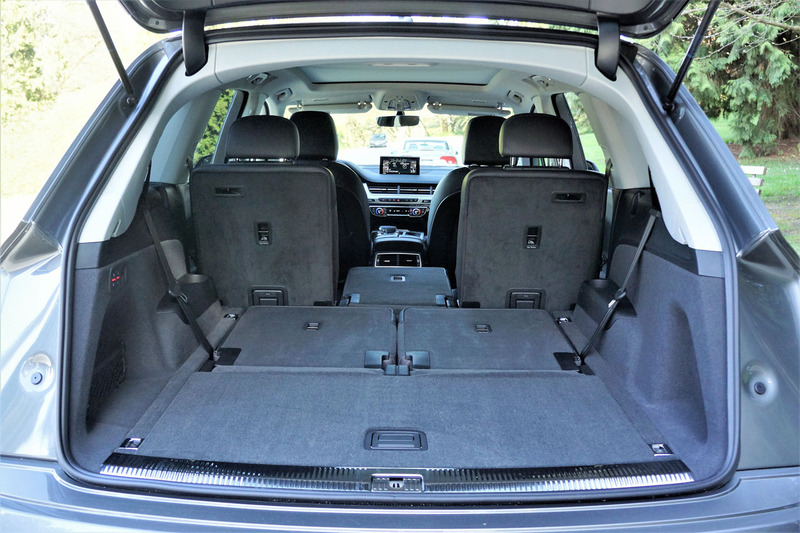 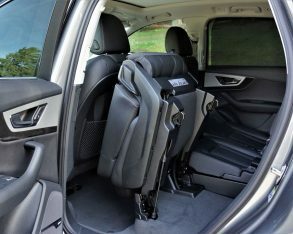 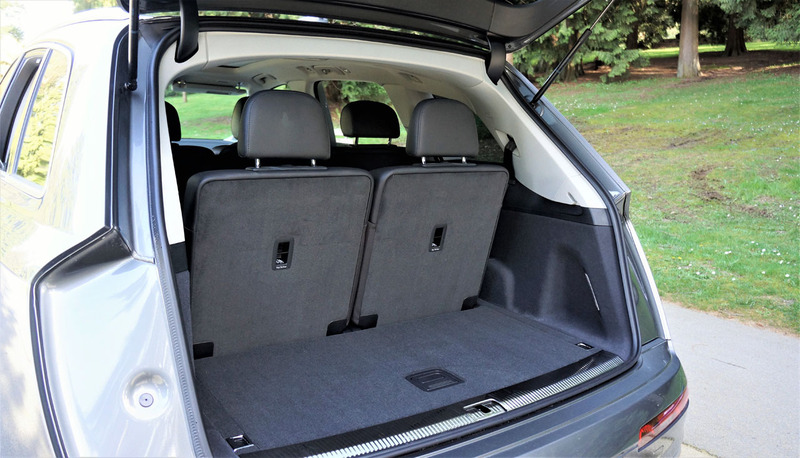 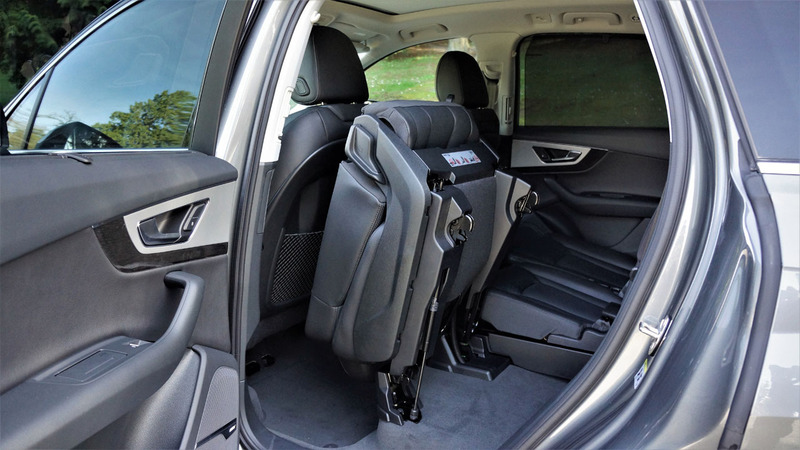 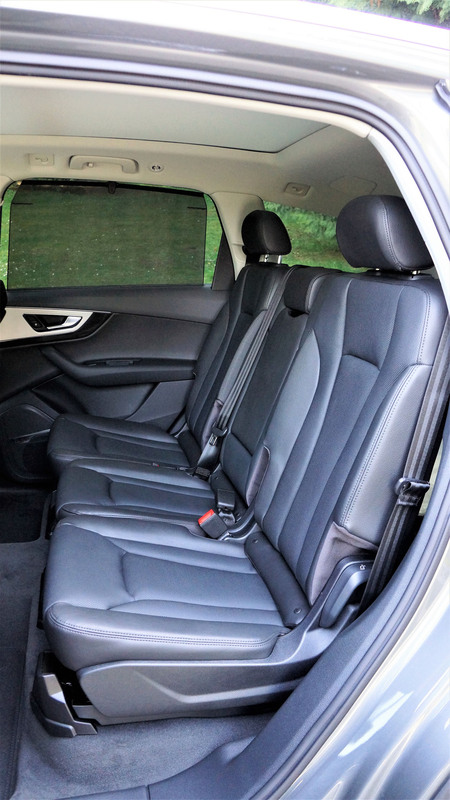 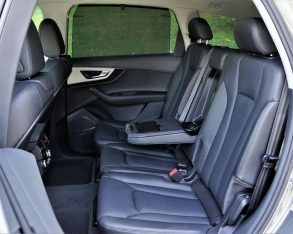 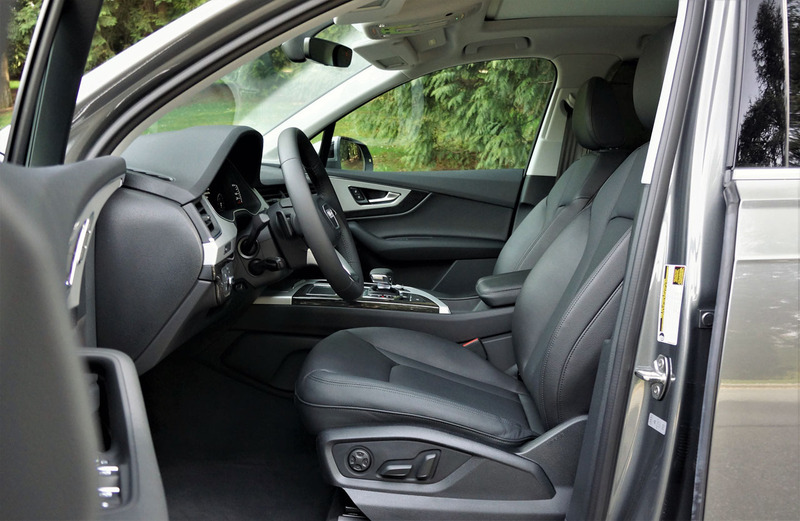 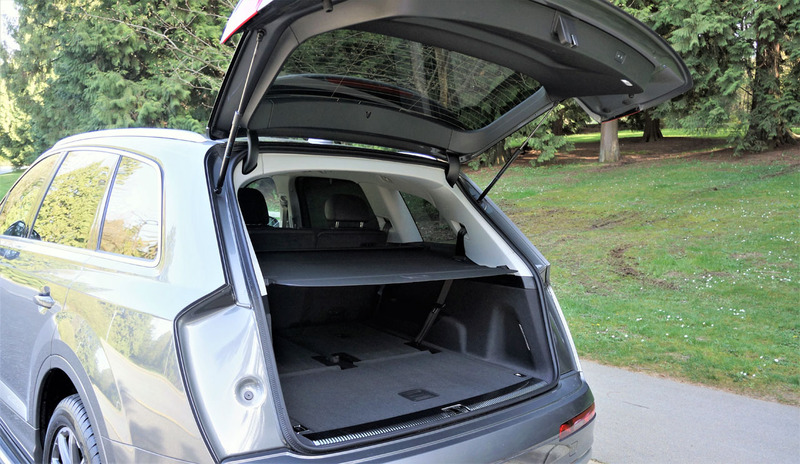 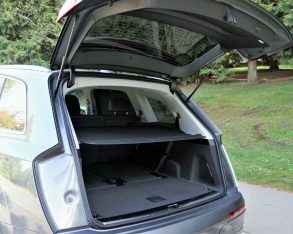 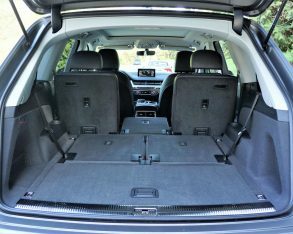 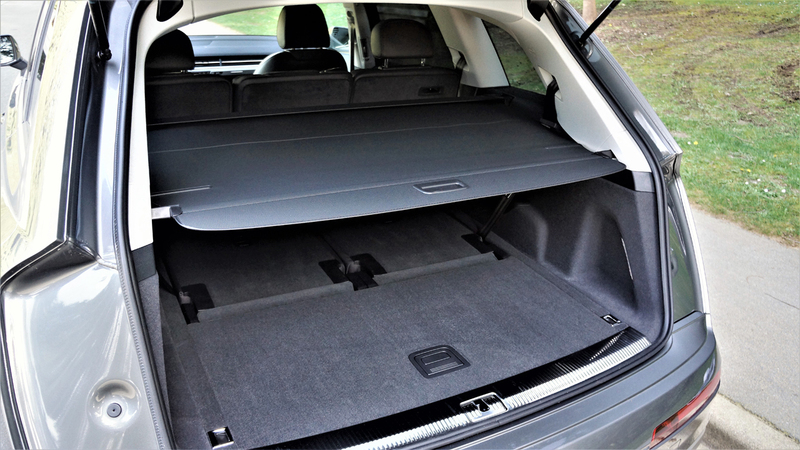 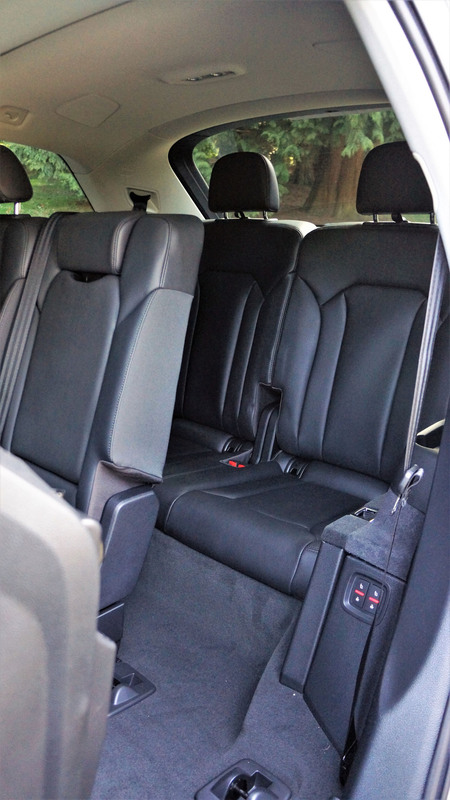 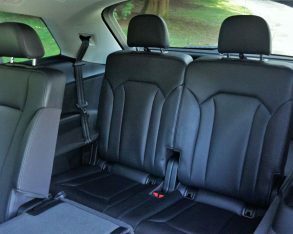 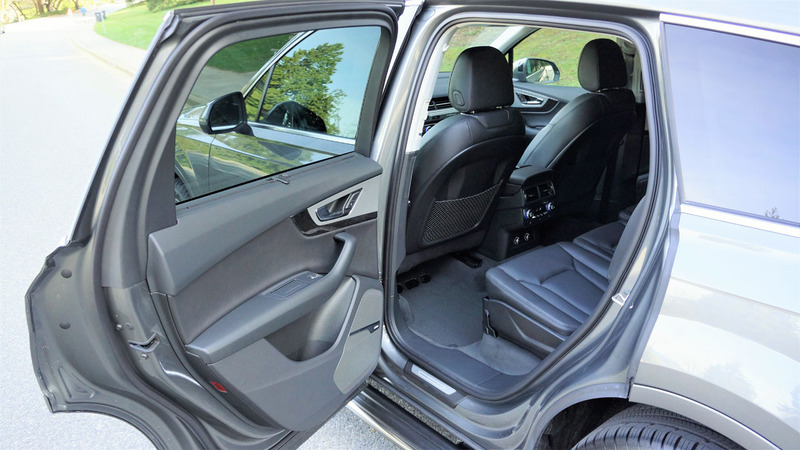 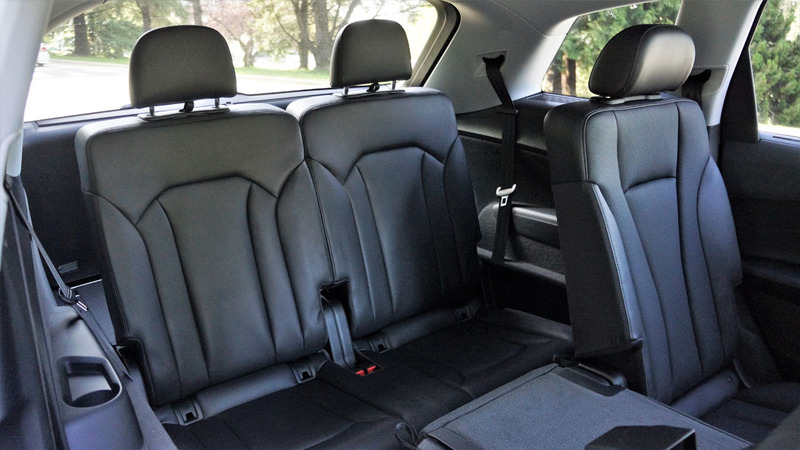 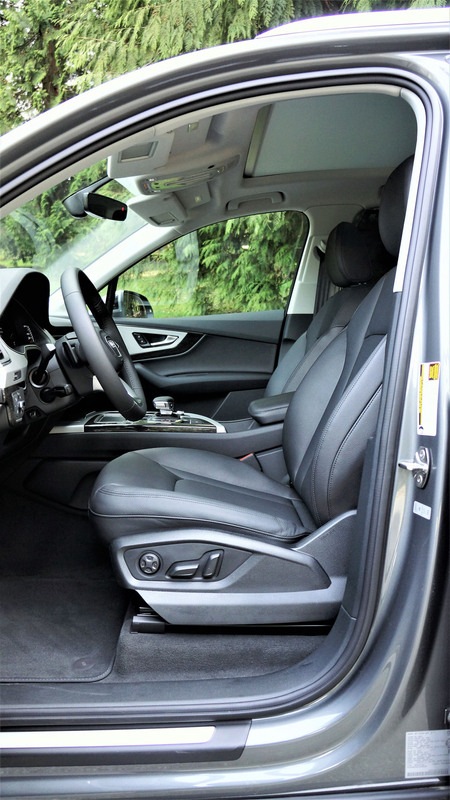 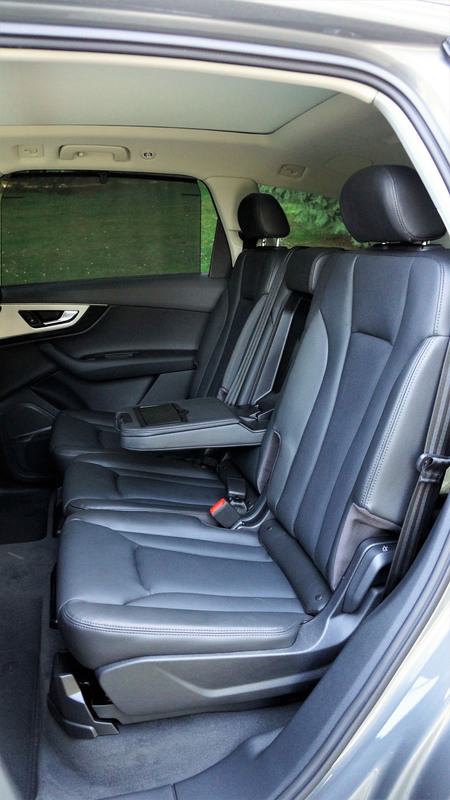 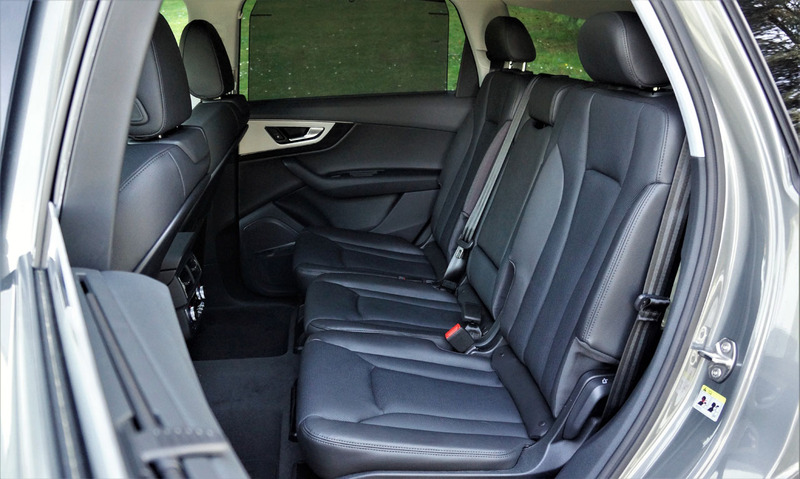 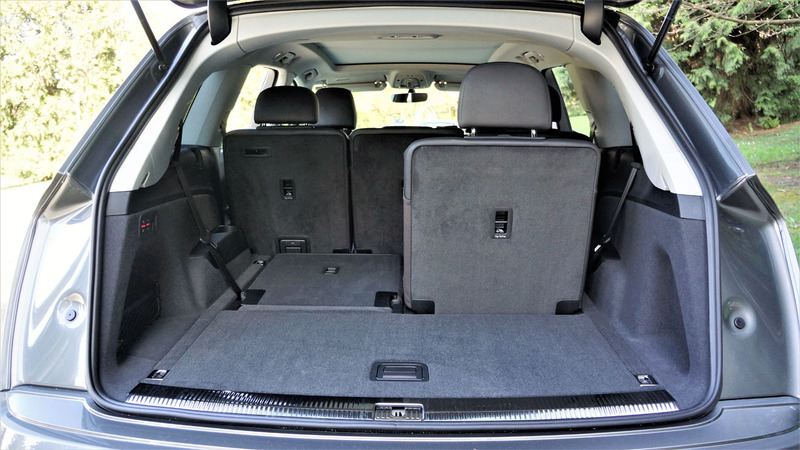 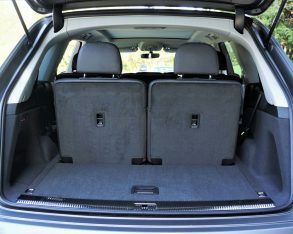 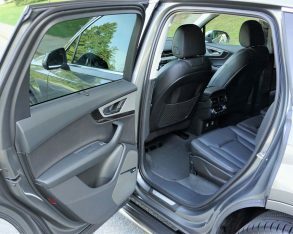 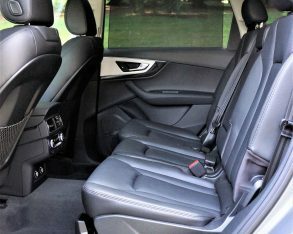 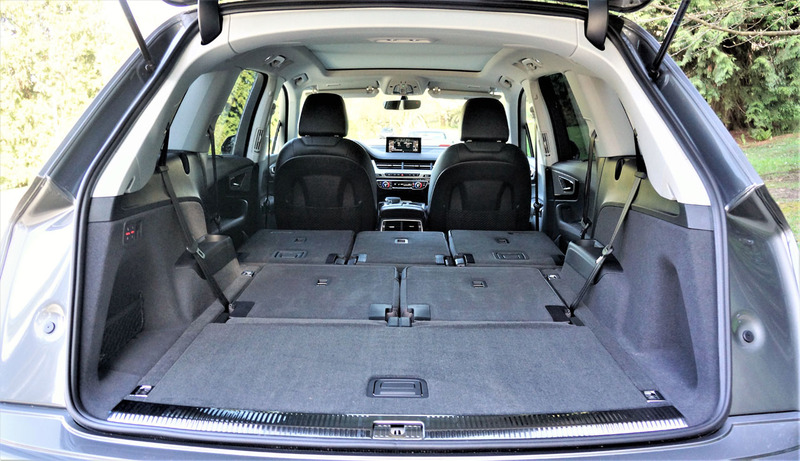 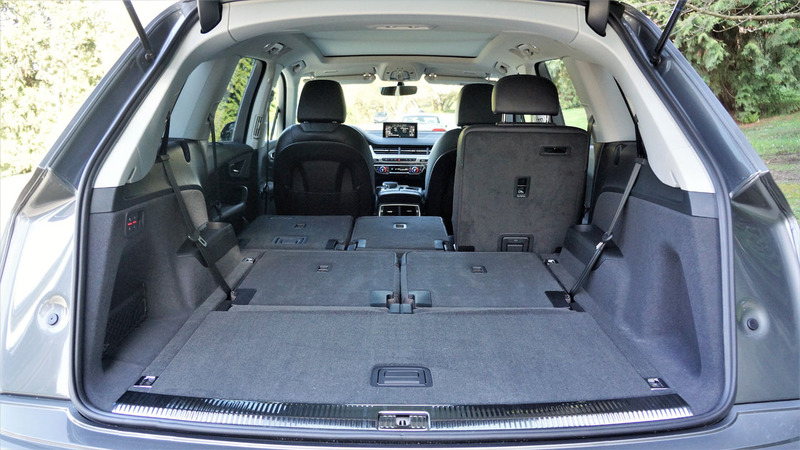 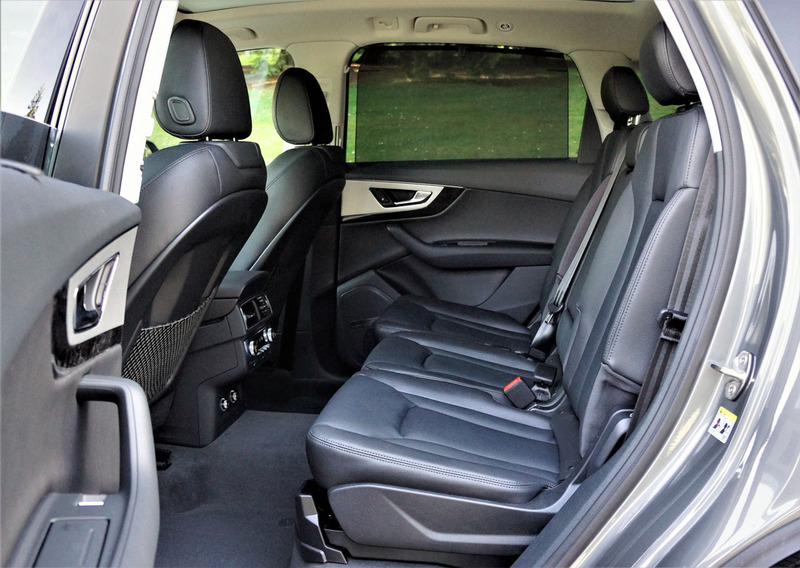 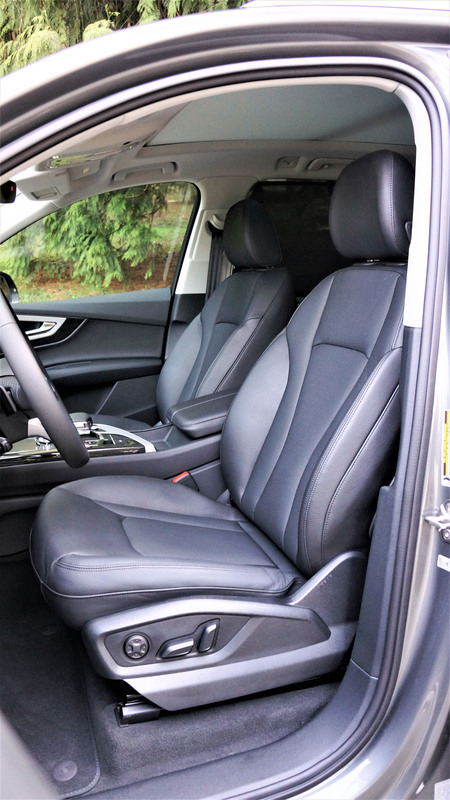 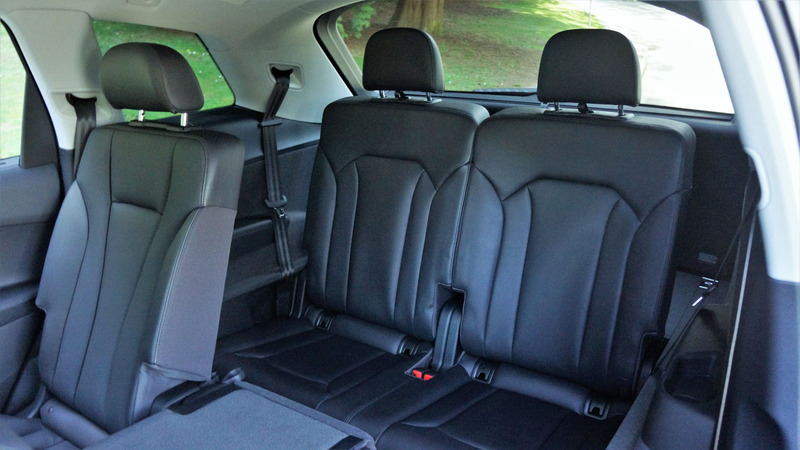 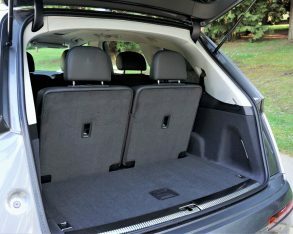 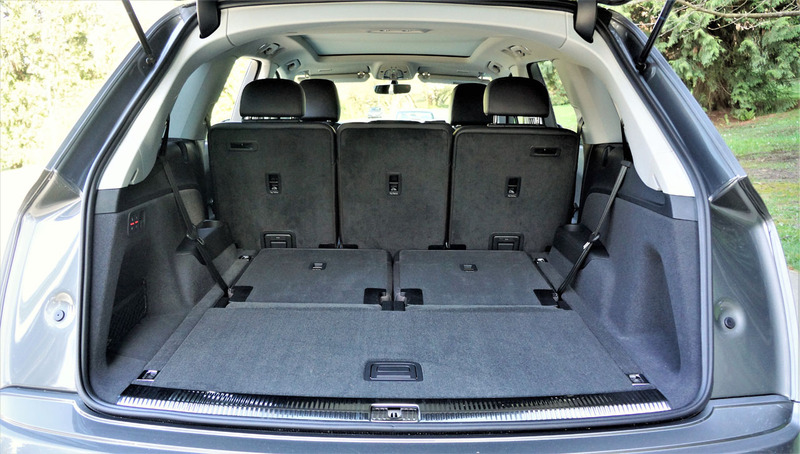 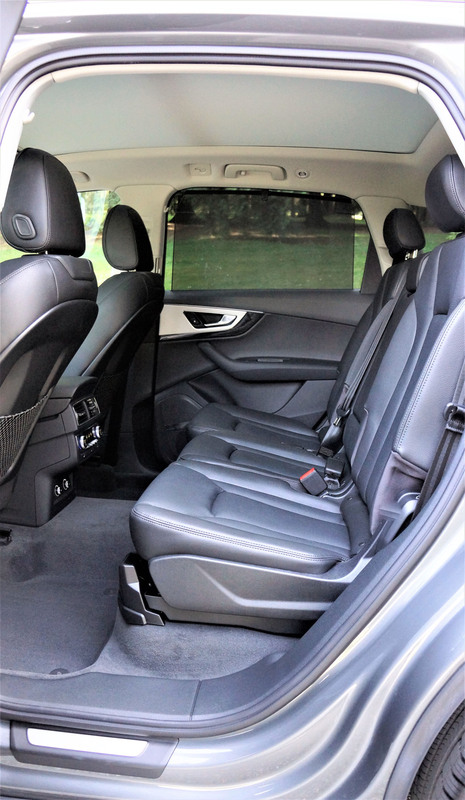 And that from an SUV that can gobble up seven occupants and much of their cargo, the area behind the rearmost seats good for 420 litres (14.8 cubic feet) of what-have-you according to the U.S. EPA, which is about as much as a generously sized sedan’s trunk, while if you fold those rear seats flat via the aforementioned power controls you’ll end up with 1,062 litres (37.5 cubic feet) behind the second row, or go a step further and you’ll have a cavernous 2,027 litres (71.6 cubic feet) of available space, and more so a completely flat load floor. 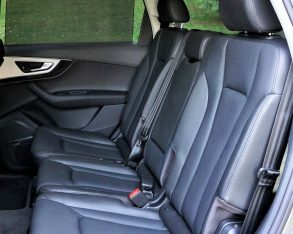 Even better, Audi was really inventive with its second row seats, as they’re not split in the usual 60/40 configuration, and not even sectioned into a 40/20/40 division that allows a narrow pass-through down the middle for skis and other long cargo, but they’re almost evenly divided at 35/30/35 for a much larger centre pass-through and a more comfortable middle seating position. 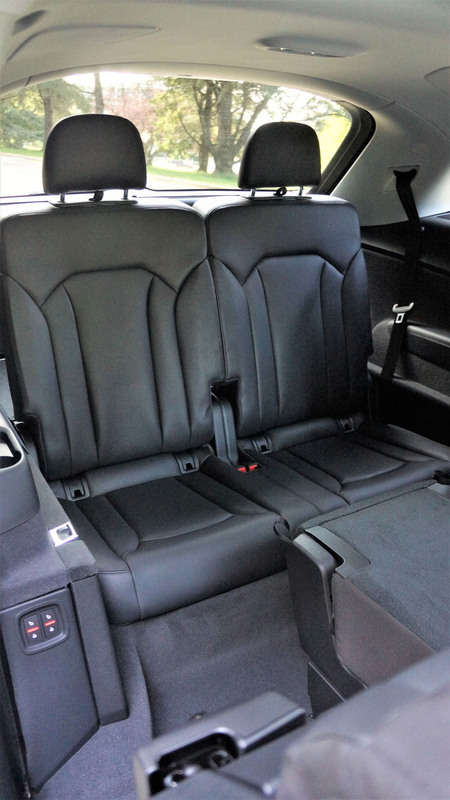 Power releases pop the second-row seats forward for easy access to the third row, and while I wouldn’t want to spend an entire day back there I was able to buckle in my five-foot-eight frame without discomfort. 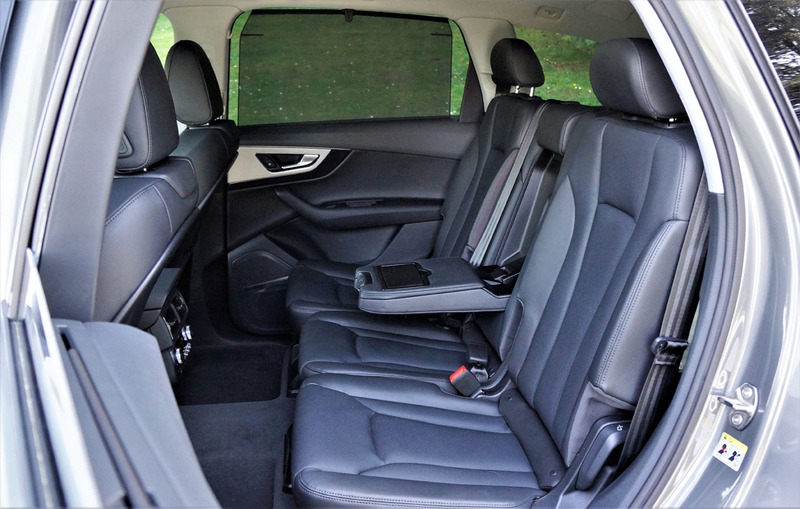 This still left plenty of legroom for second-row passengers, which certainly won’t be able to complain about spaciousness in all other directions either, or comfort. 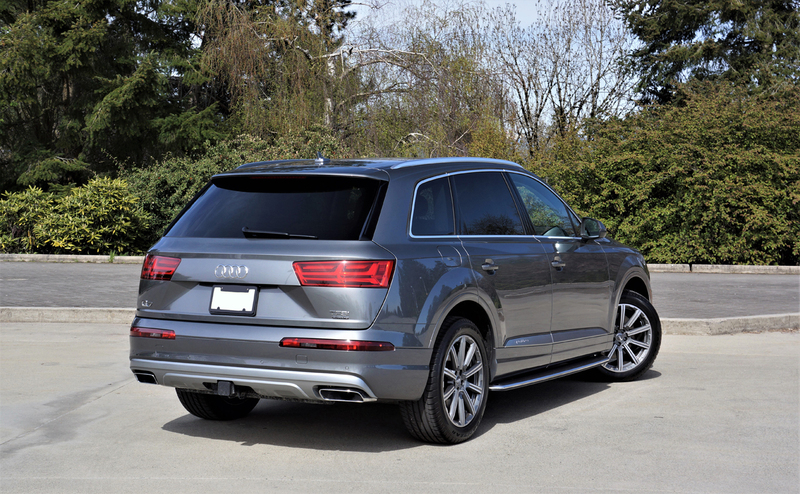 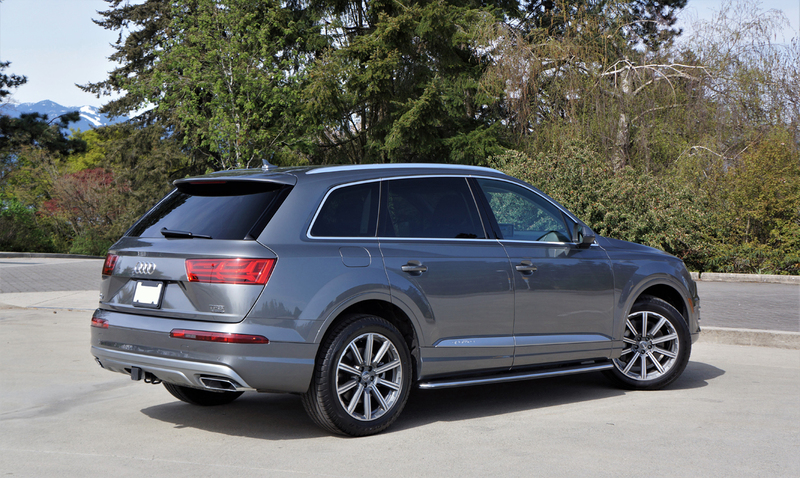 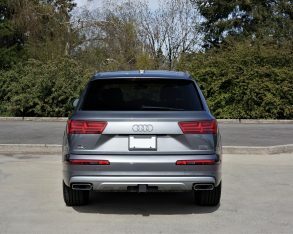 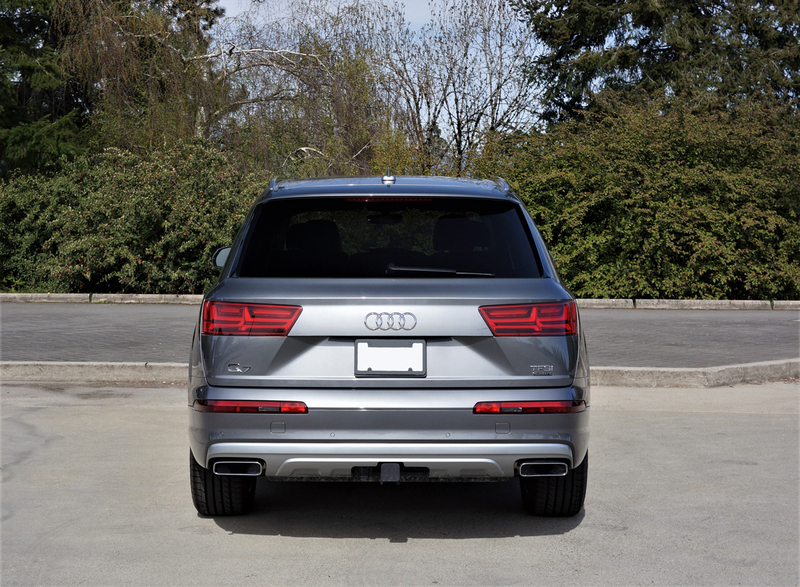 Is the Q7 the best mid-size luxury SUV available today like I inferred at the beginning of this review? 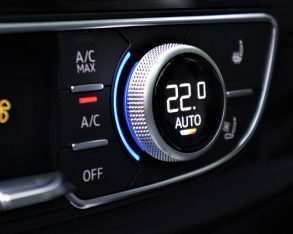 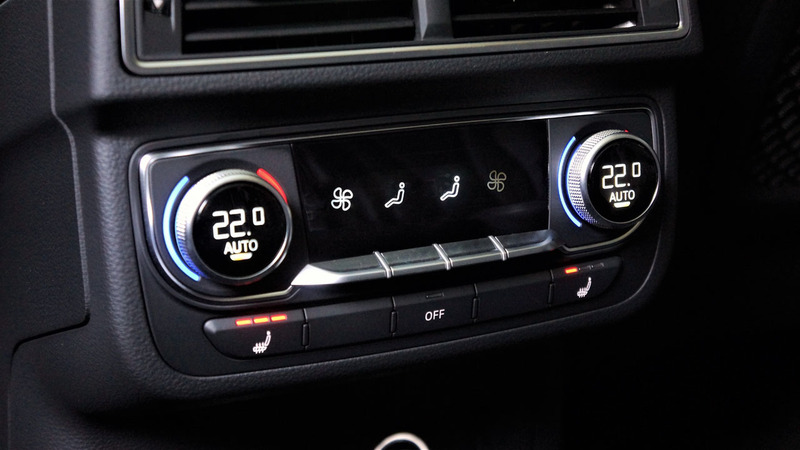 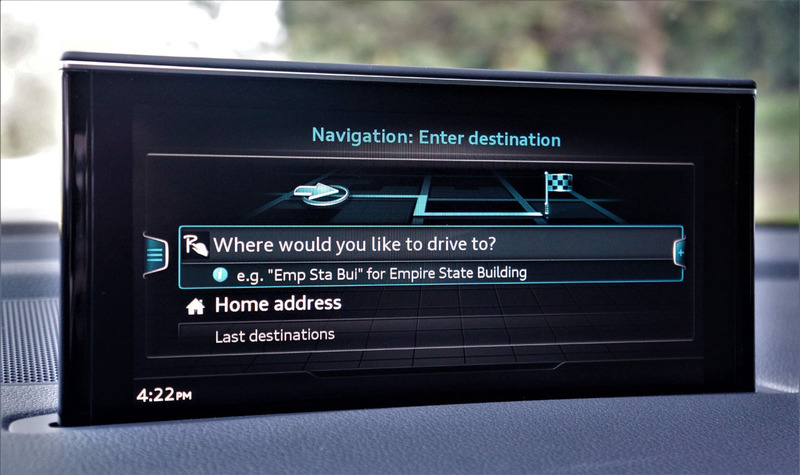 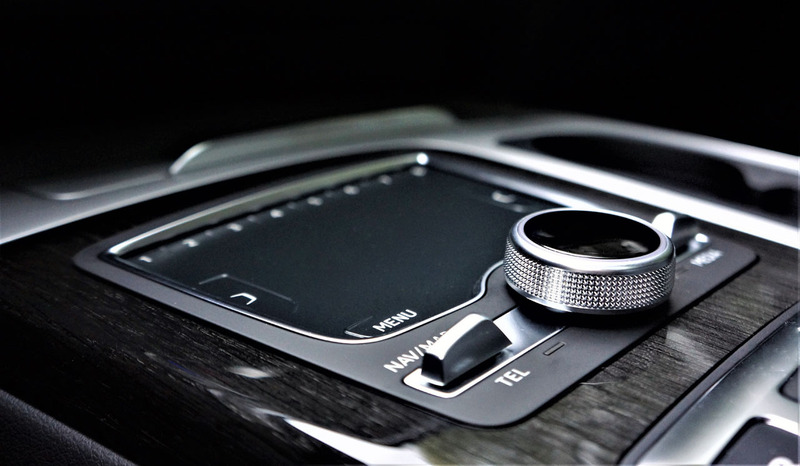 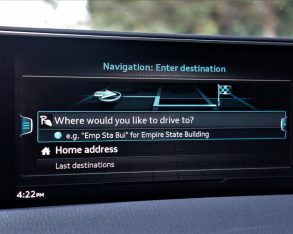 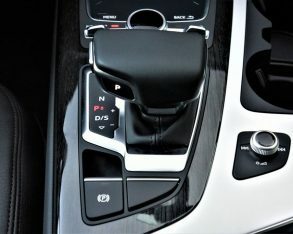 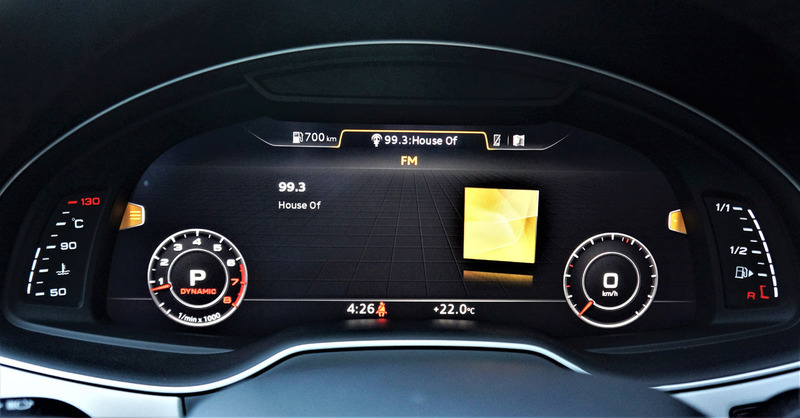 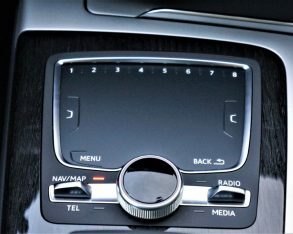 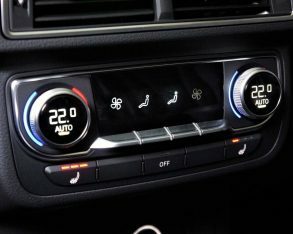 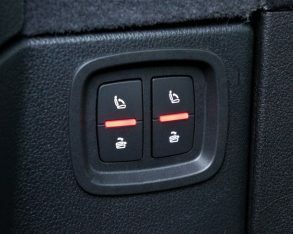 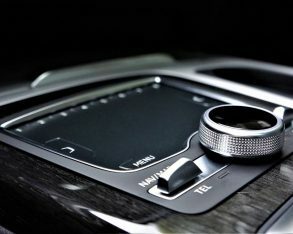 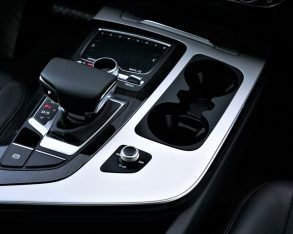 My answer would depend on your personal priorities, such as performance over luxuriant pampering, how you prefer controlling infotainment functions, from a simple, straightforward touchscreen or via a rotating knob, touchpad (for pinch, swipe and finger gesture capability) and surrounding buttons on the lower console as Audi provides. 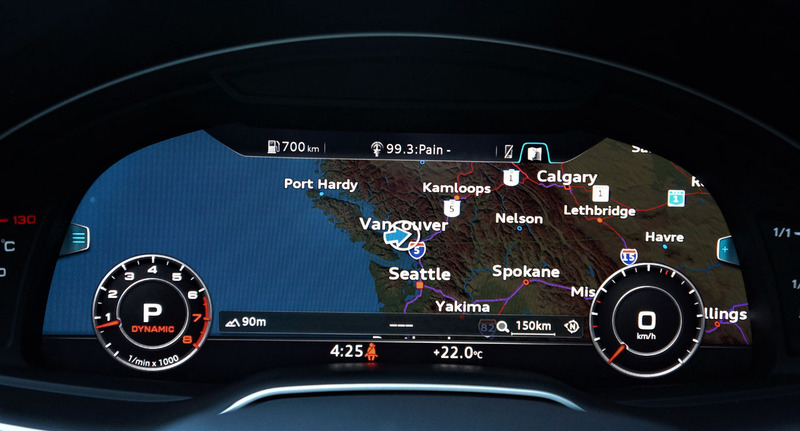 The system is excellent and incorporates Apple CarPlay and Android Auto, accurate navigation, superb backup and overhead cameras, plus its depth of colour, resolution and overall speed of operation can’t be faulted. 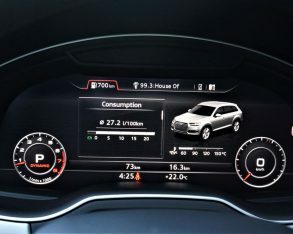 Added to this, the Audi Virtual Cockpit is by far best of the best when it comes to digital gauge clusters. 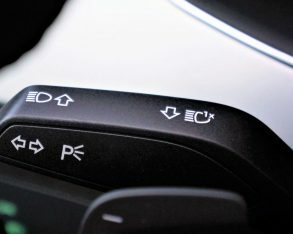 I love how the “VIEW” button on the left steering wheel spoke expands the multi-info display to epic proportions, leaving smaller digital dials for speed and tachometer readings. 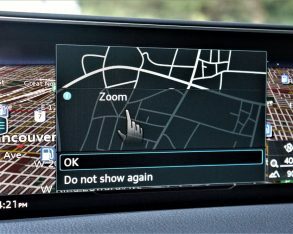 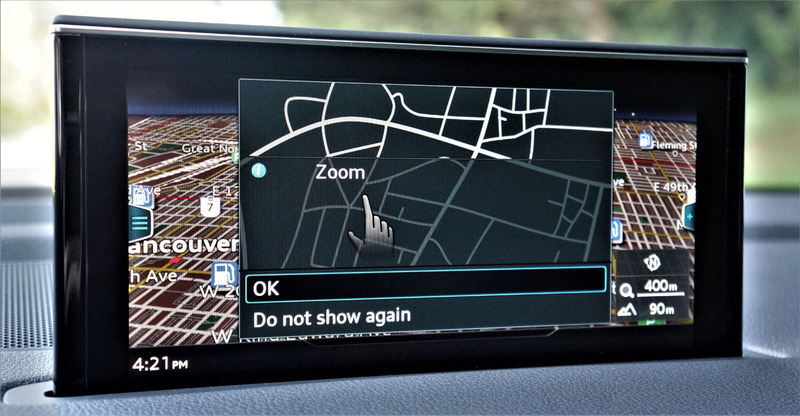 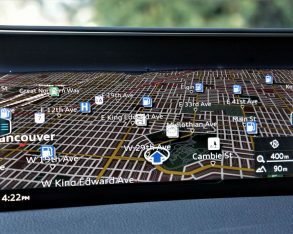 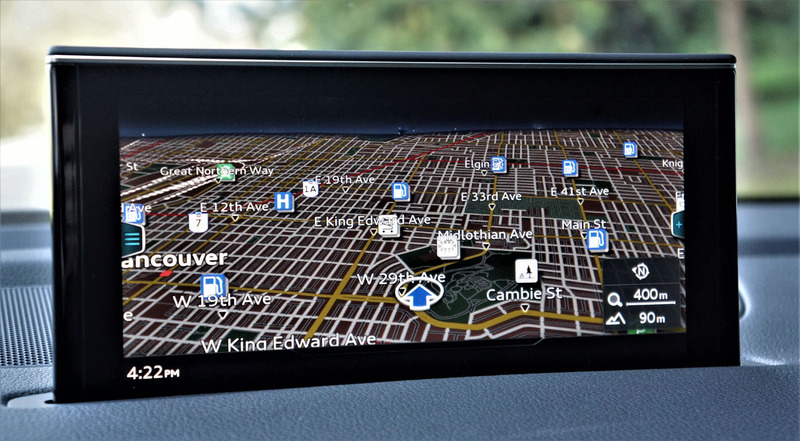 This allows the navigation mapping and route guidance info to almost completely take over the display, or one of many other functions within the system. 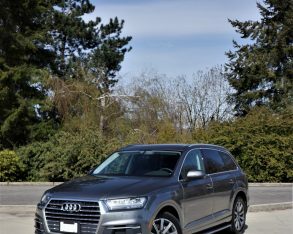 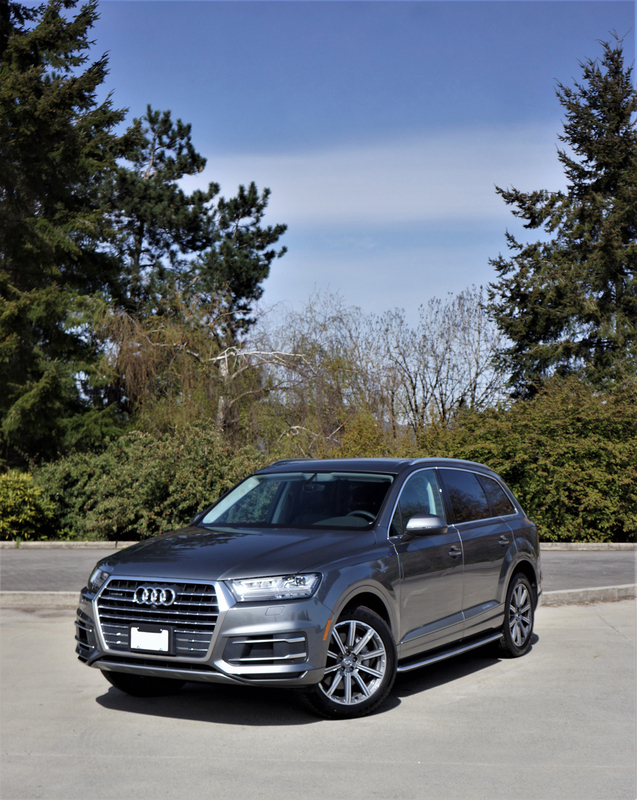 Yes, it’s difficult not to love the Audi Q7, which is why there are so many on Canadian roads. 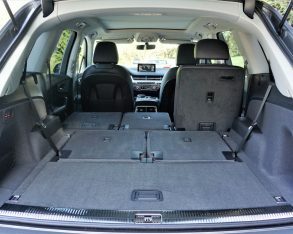 It would be unwise to buy into this category without experiencing a Q7 first hand, as it’s easily one of the best on offer.